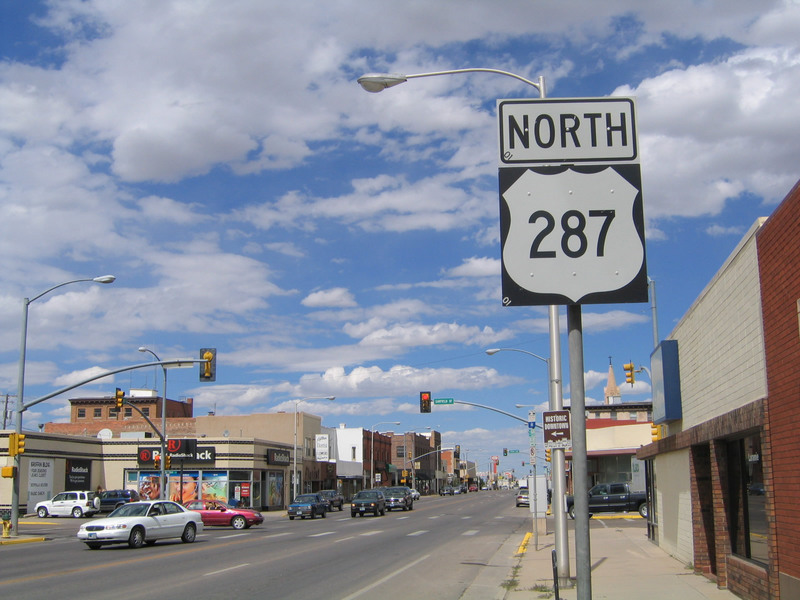 This U.S. 287 north reassurance shield is located along Third Street in downtown Laramie just before the Garfield Street intersection. Photo taken 09/07/05. 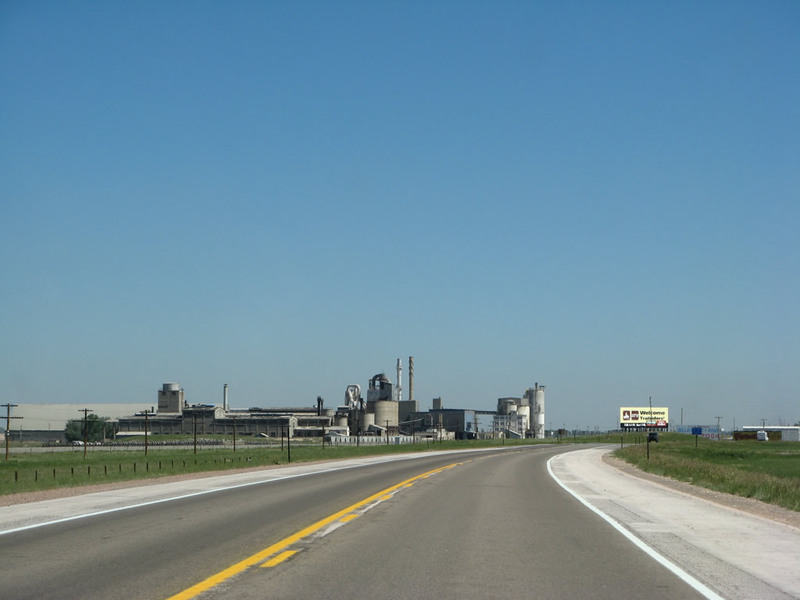 U.S. 287 is a major diagonal route from Texas 87 in Port Arthur, Texas, northwest to U.S. 89 at Choteau, Montana. The entire trip is 1,791 miles (excluding the break through Yellowstone National Park), according to the most recent U.S. highway log. This makes U.S. 287 the longest three-digit U.S. Highway in the nation. U.S. 287 follows State Control Route 23 from Colorado to Medicine Bow via Laramie, State Control Route 410 from Medicine Bow to Walcott Junction, Interstate 80 from Walcott Junction to Rawlins, State Control Route 21 from Rawlins to Muddy Gap, State Control Route 20 from Muddy Gap to Lander, State Control Route 15 from Lander to Diversion Dam Junction, State Control Route 30 from Diversion Dam Junction to Moran Junction, and State Control Route 10 from Moran Junction to Yellowstone National Park. 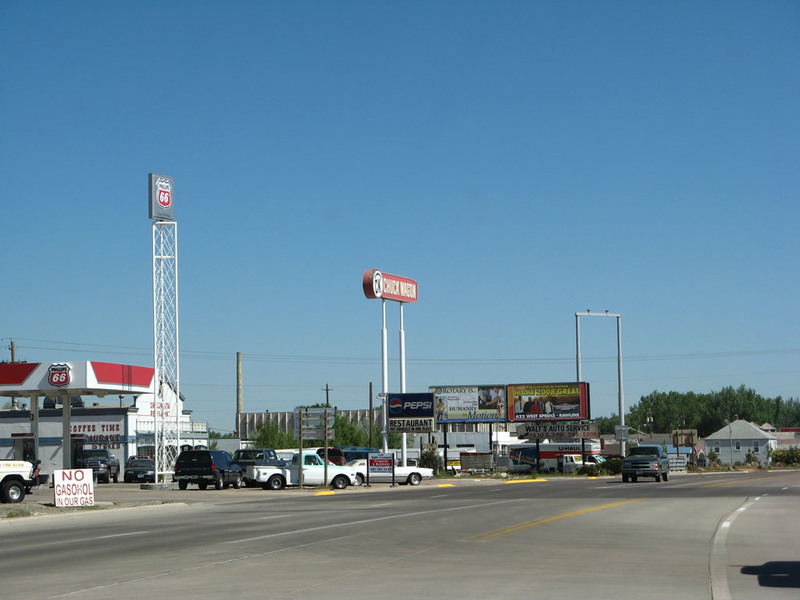 Bypass U.S. 287 in Rawlins serves as a more direct route for through travelers to the northeast of the city just north of its junction with Interstate 80. 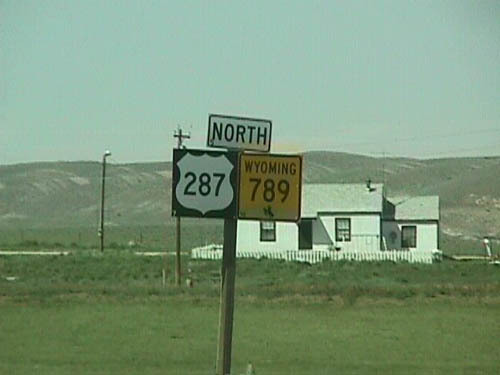 In addition, there used to be a Wyoming 287 between 1936 and 1950. During this time, U.S. 287 between Lander and Diversion Dam Junction jogged north along modern Wyoming 789 and U.S. 26 to serve Riverton. 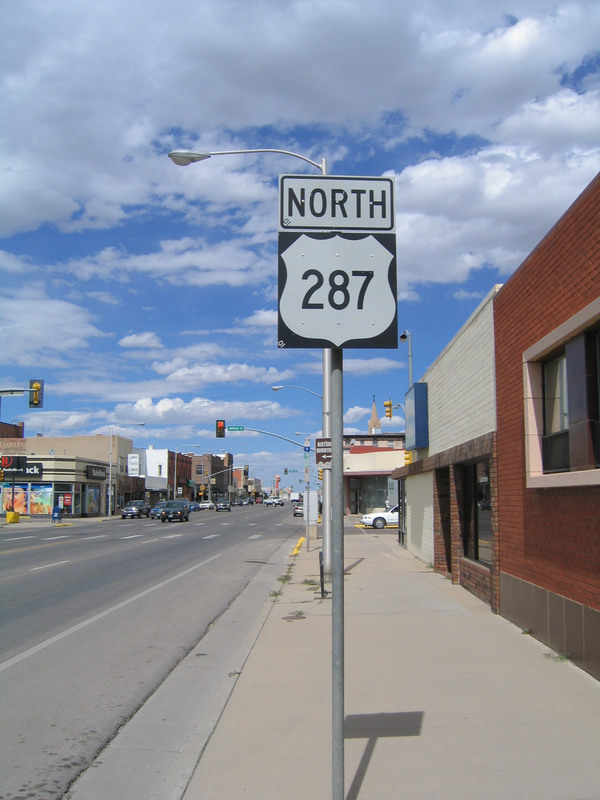 Wyoming 287 was the more direct route that was replaced in 1950 by newly rerouted U.S. 287. 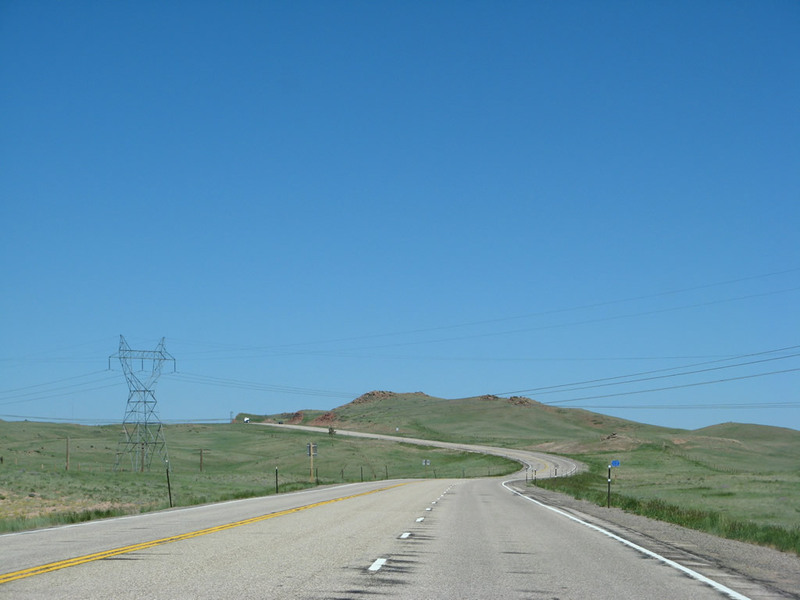 The old routing of U.S. 287 became Wyoming 320 (Wyoming 789 in 1954) from Lander to Riverton and U.S. 26 from Riverton to Diversion Dam Junction. 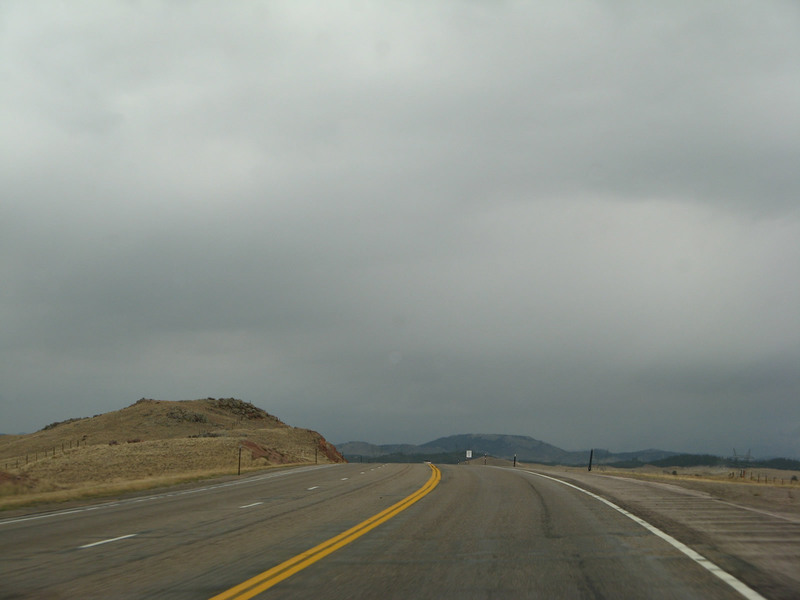 The Rocky Mountain Highway followed U.S. 287 across Wyoming. the "Rocky Mountain Highway" route was originally considered for admission to the "Park to Park Highway," but was rejected by the highway's association around 1920. 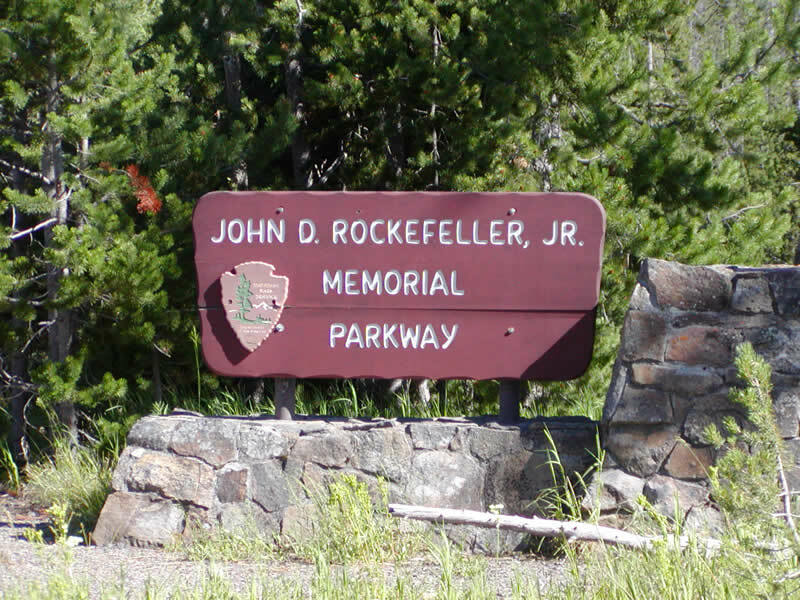 The "Rocky Mountain Highway" then became an independent entity to compete with the Yellowstone/Park to Park system. 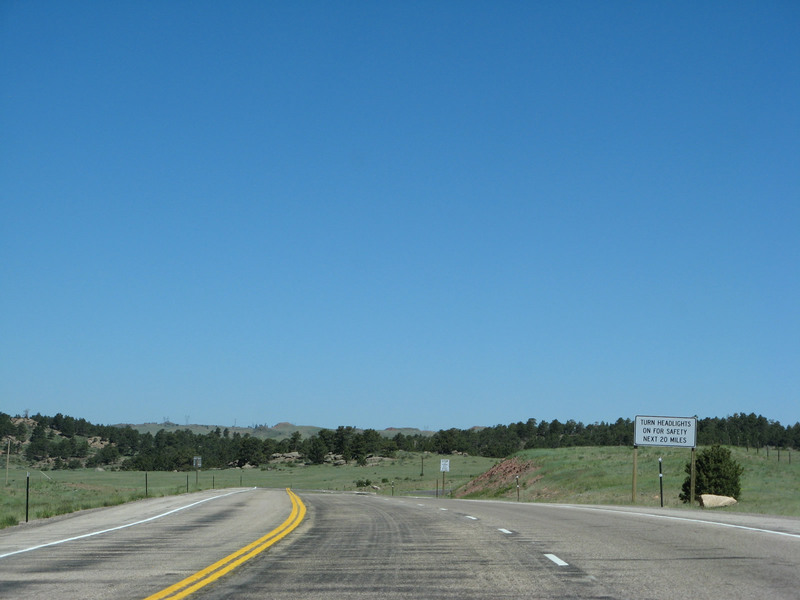 U.S. 287 is not one of the original 1926 U.S. routes in Wyoming. 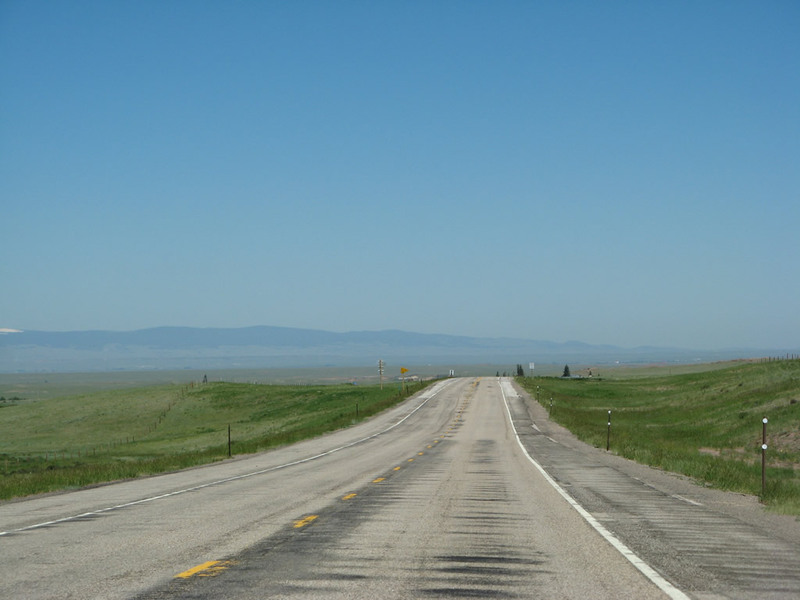 That year there was a Wyoming 287, which was the route of modern-day U.S. 189 from old U.S. 30N at Kemmerer north to U.S. 187 at Daniel Junction. By 1933, Wyoming 287 was extended south to U.S. 30S near the old communities of Spring Valley and Piedmont. 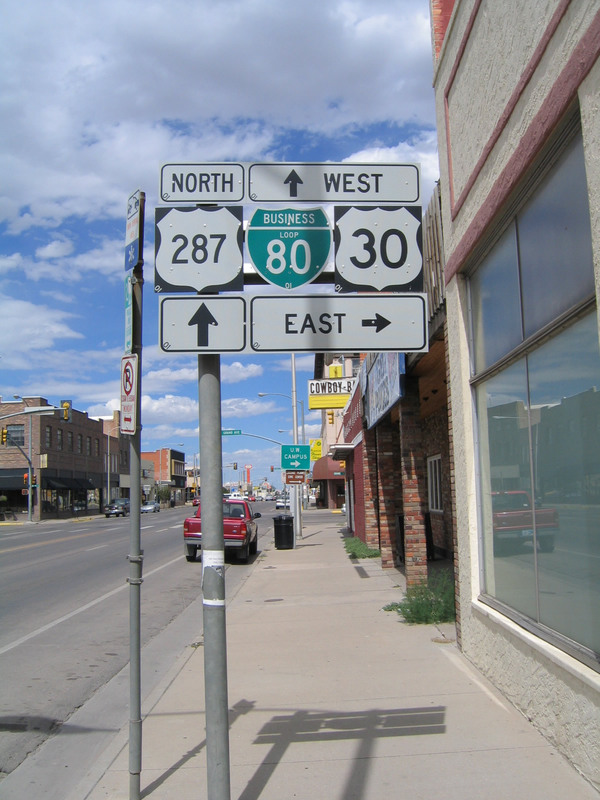 In 1936, the year of a major recommissioning of U.S. routes in Wyoming, Wyoming 287 was renumbered U.S. 89. 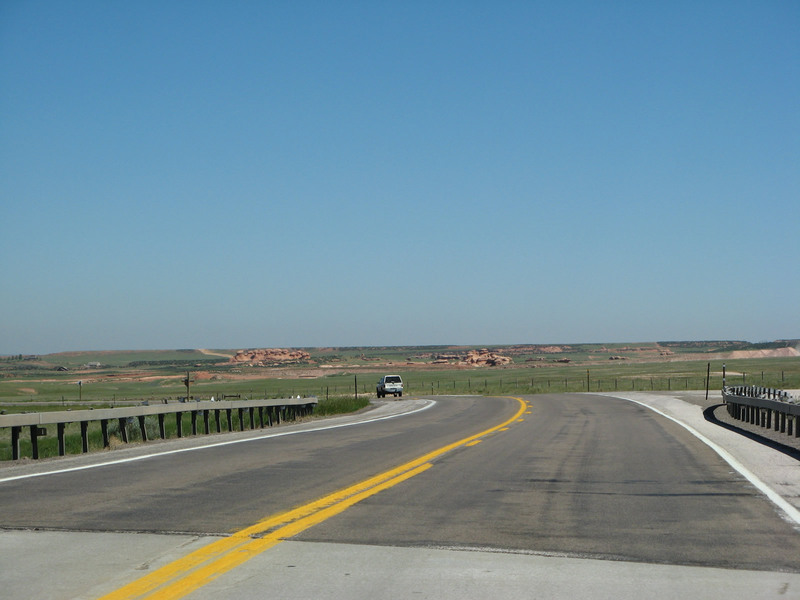 At the same time, U.S. 287 was routed via U.S. 285 from Fort Collins, Colorado, to Laramie, cosigned with U.S. 30 between Laramie and Rawlins, replaced U.S. 87 between Rawlins and Muddy Gap, and replaced U.S. 87W between Muddy Gap and Yellowstone National Park. 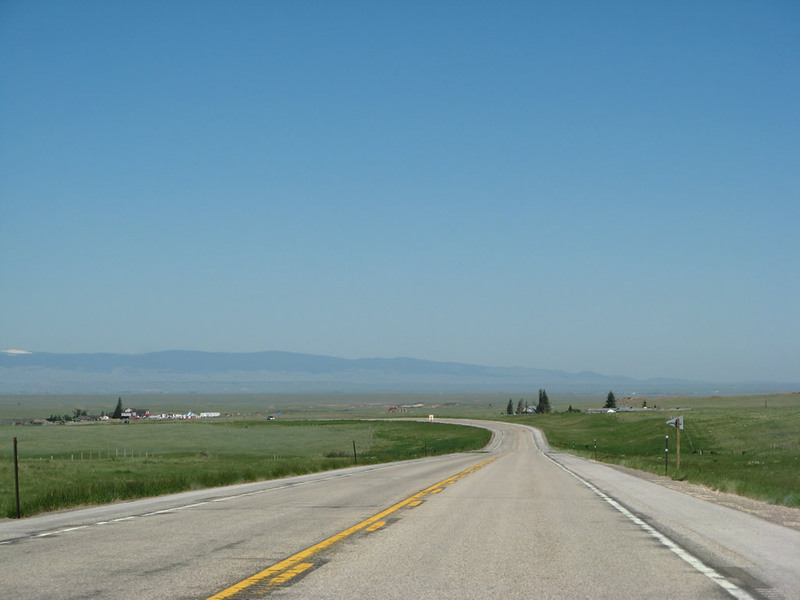 U.S. 87W in Montana was replaced by U.S. 89, and Montana 287 was created along the current path of U.S. 287. By the 1960s, Montana 287 was commissioned as U.S. 287. For more on the U.S. 87E/W split, see the listing for U.S. 87. At this time, U.S. 287 went from Lander to Riverton then west to Diversion Dam Junction, following the path of modern-day Wyoming 789 and U.S. 26. 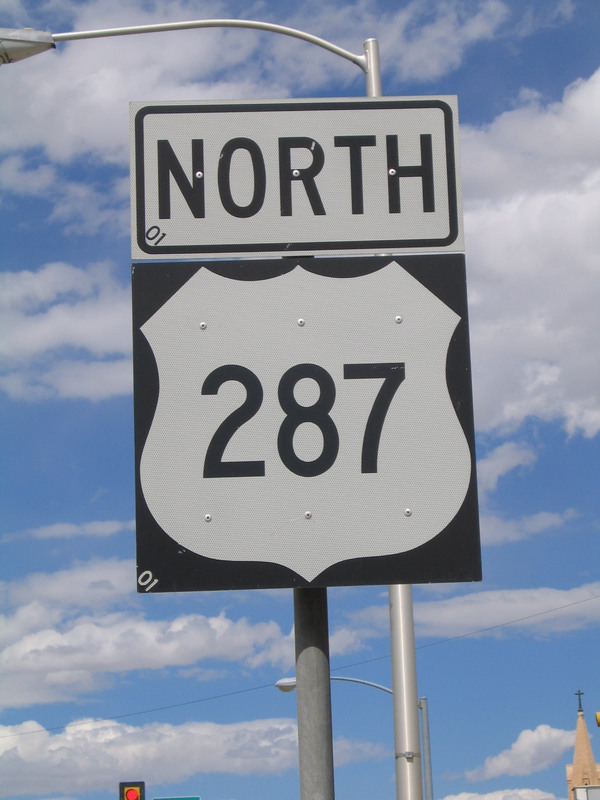 In 1936, the modern-day U.S. 287 was known as Wyoming 287. 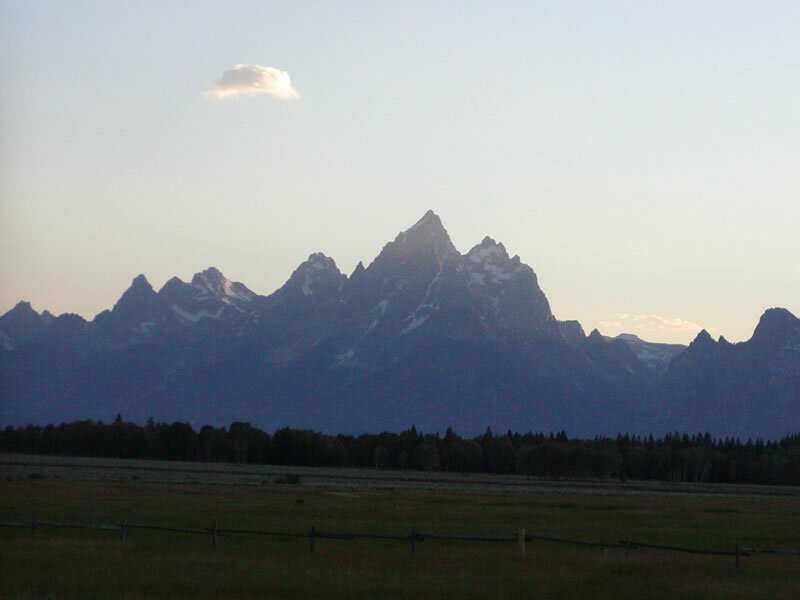 This provided a choice for travelers heading to Grand Teton and Yellowstone National Parks: the shorter route via Wyoming 287 or the longer route via U.S. 287. 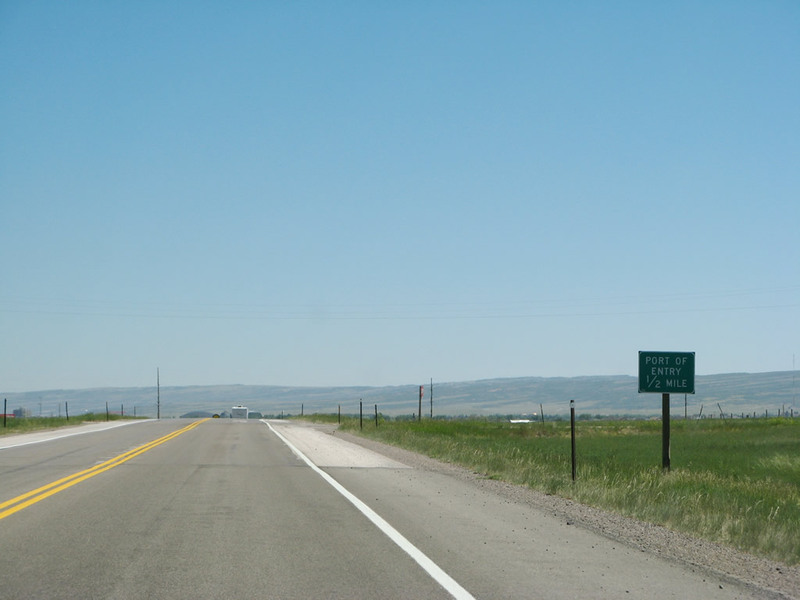 By 1940, U.S. 287 had been rerouted to avoid Riverton altogether, and the old U.S. 287 was renumbered as Wyoming 320 and Wyoming 287. So the dual "Highway 287" routing persisted. 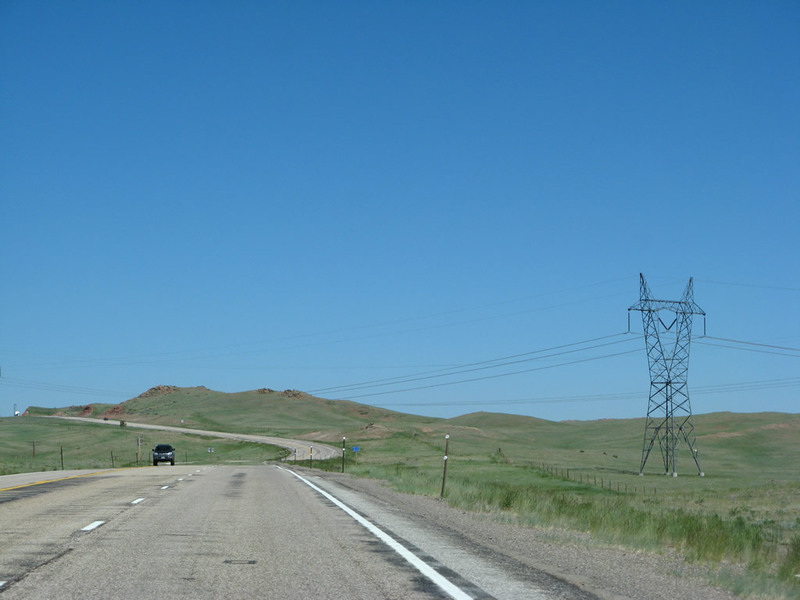 Ten years later, in 1950, this dual 287 situation was eliminated with the commissioning of U.S. 26 across the middle of Wyoming. Wyoming 320 was then renamed Wyoming 789 when that route was commissioned in 1954. As an interesting aside, Wyoming is not the only state that faced a dual Route 287 situation. 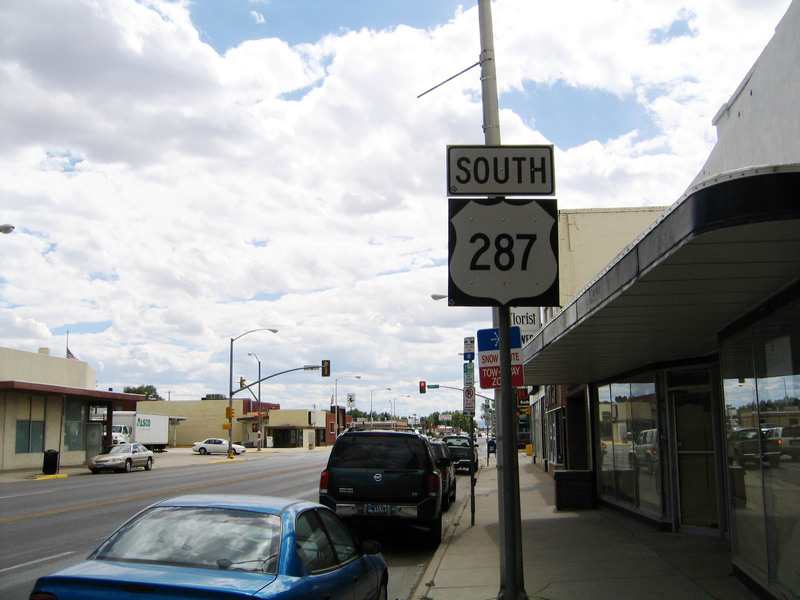 In Montana, there is currently an intersection between U.S. 287 and Montana 287. 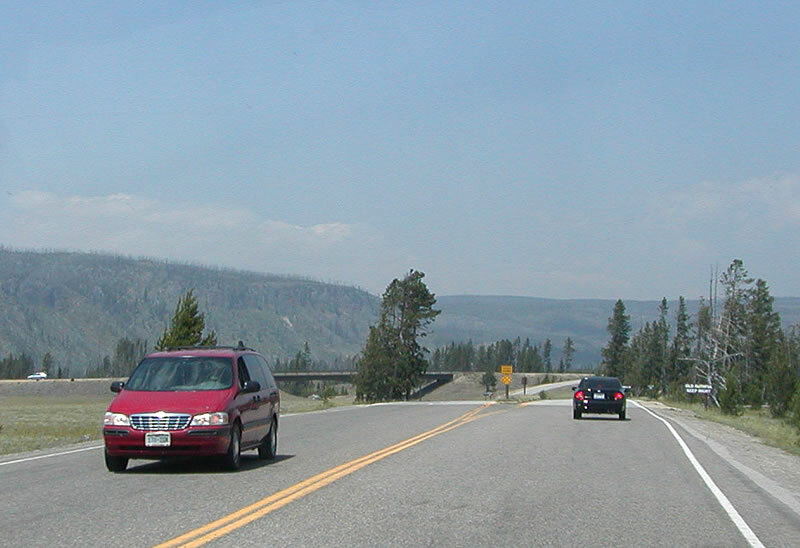 Prior to the late 1960s, U.S. 287 ended at Yellowstone. 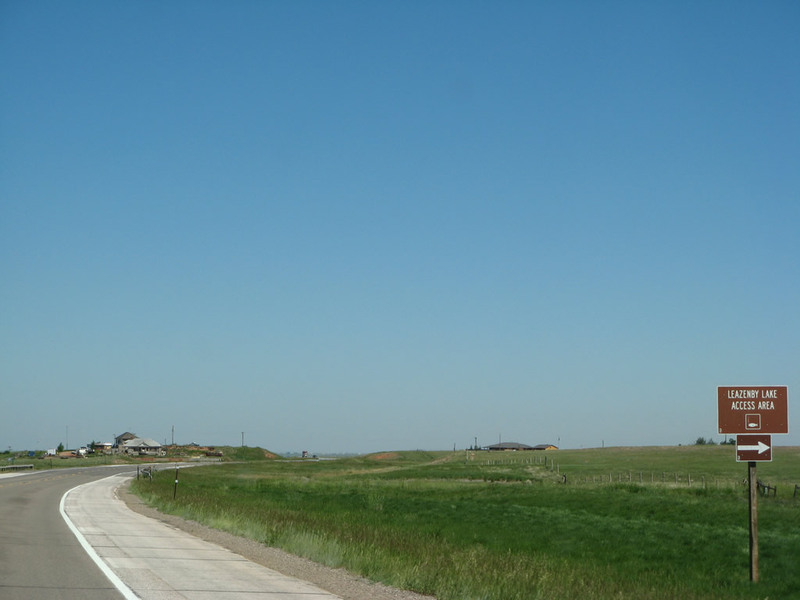 Montana 287 was likely chosen as a putative extension of U.S. 287. But when they extended U.S. 287 into the state, instead of following the route of Montana 287, they took the obvious shortcut from Ennis north to (then) U.S. 10. 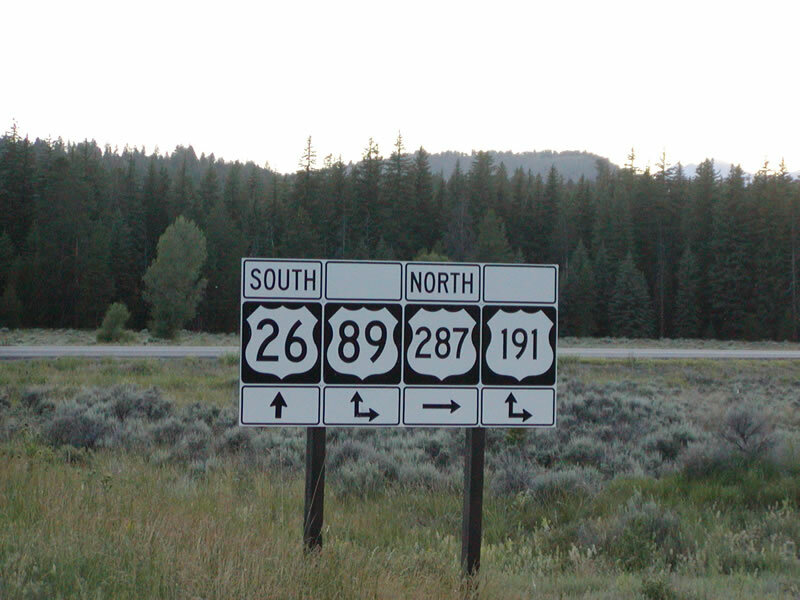 Instead of renumbering the remaining portion of Montana 287, they left it the same. 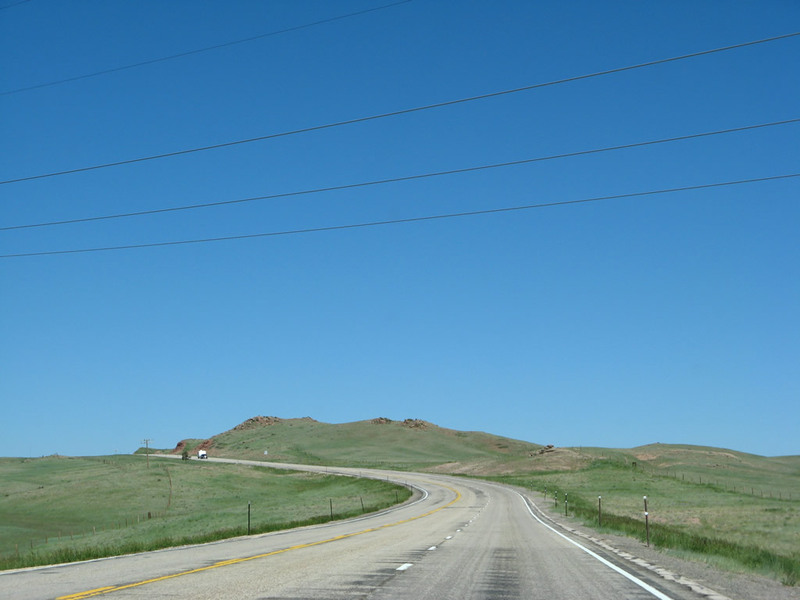 Meanwhile, back in Wyoming, U.S. 287 gained its current route in 1950, with the exception of the section it shares with Interstate 80 between Walcott Junction and Rawlins. 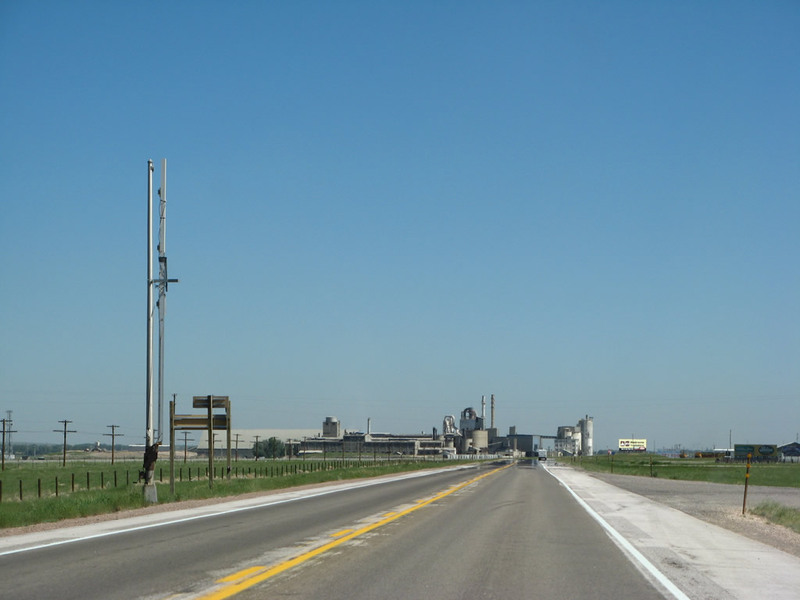 That section of Interstate highway was completed in the late 1960s and early 1970s, and the U.S. 287 routing was moved along with U.S. 30 onto Interstate 80. 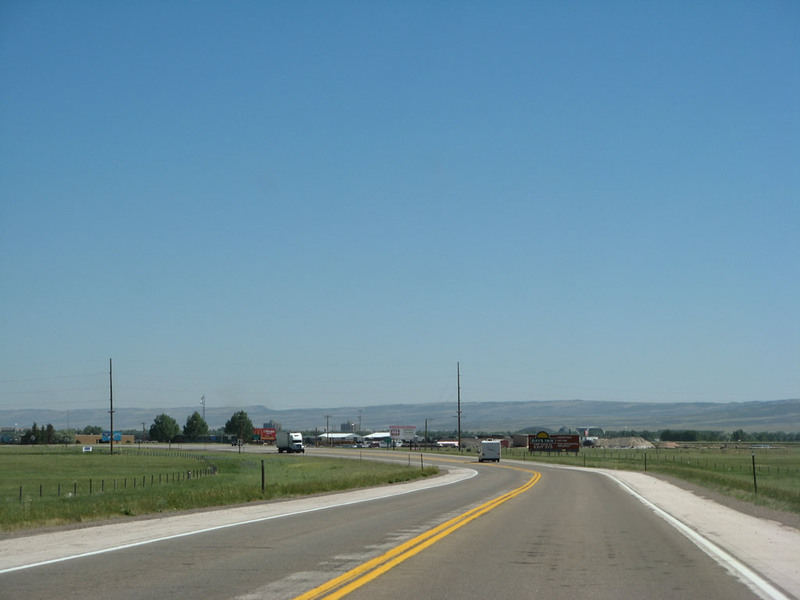 U.S. 287 crosses into Wyoming from Colorado about eight miles south of Tie Siding. Just over a mile north of the state line, U.S. 287 reaches a summit of 8,106 feet on the Pumpkin Vine Hill. Several sections of U.S. 287 through here, including near the summit of Pumpkin Vine Hill, are three lanes, with two lanes heading southbound and one lane heading northbound. 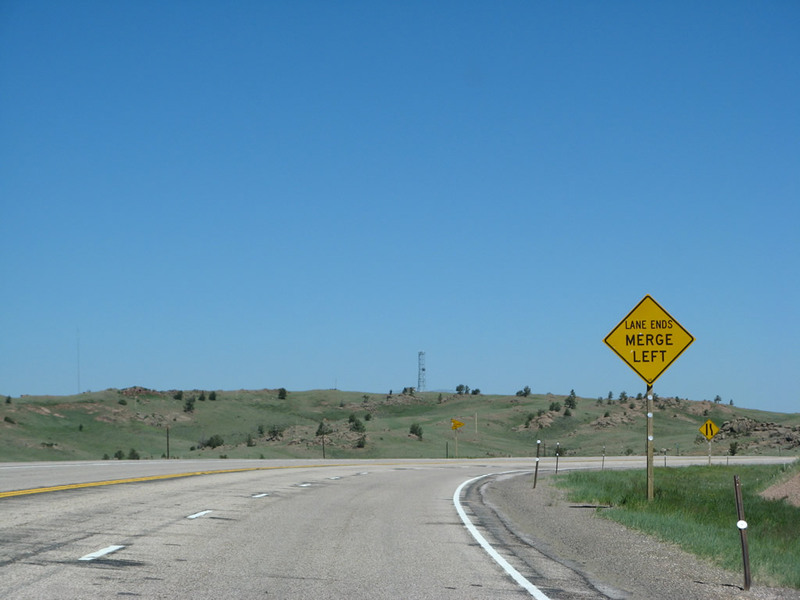 In this three-lane situation, Wyoming law allows vehicles heading northbound to pass using the left southbound lane, causing some to refer to that lane as a "suicide lane." 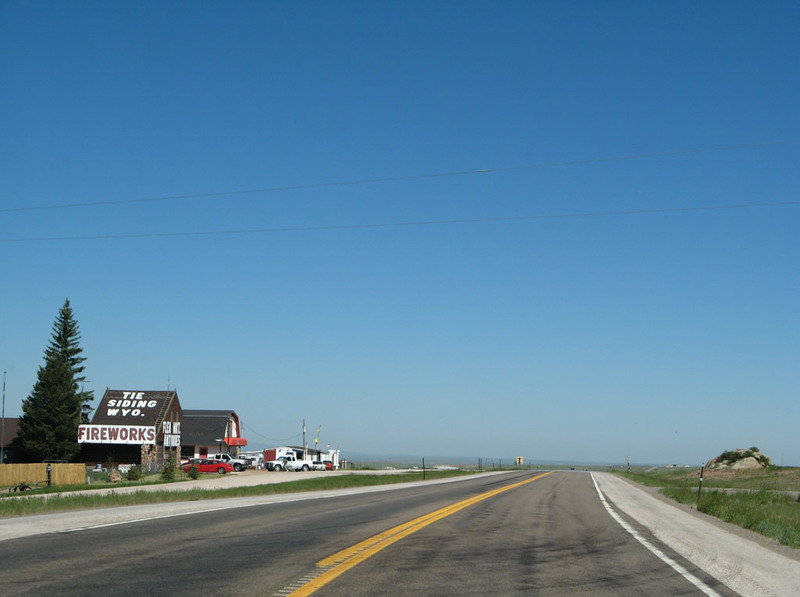 U.S. 287 gradually descends into Tie Siding and Laramie, the Gem City. There are several miles of snow fences all along this route, which protect the road from blowing snow and ground blizzards. 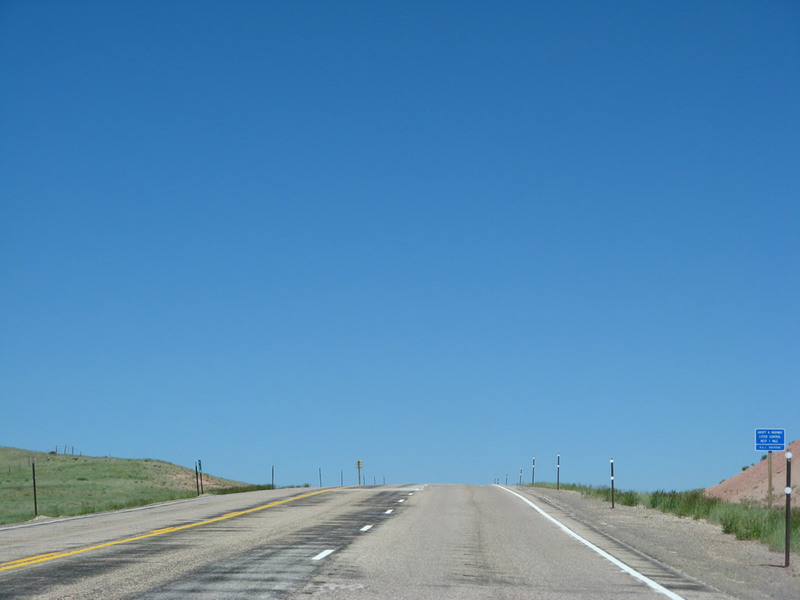 The drive along U.S. 287 between the state line and Tie Siding is fairly mountainous, with passing lanes available in both directions. 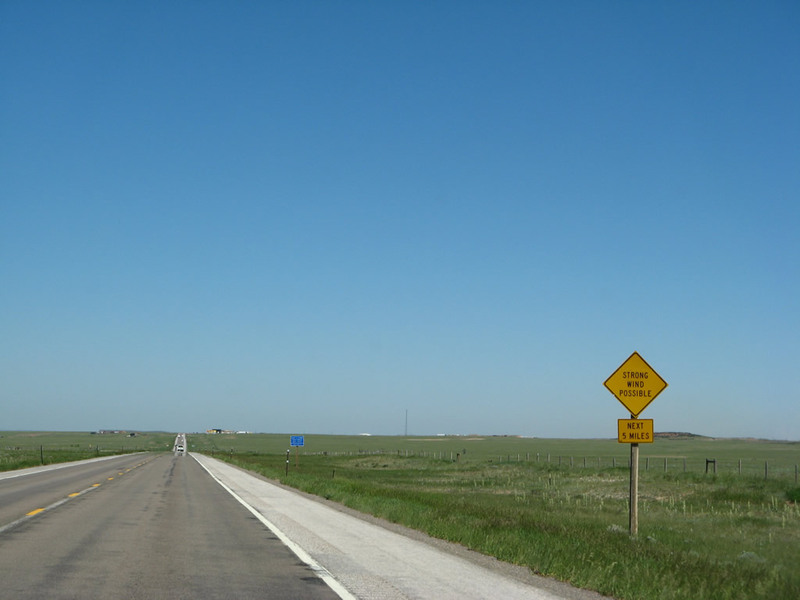 Once the highway descends into the Laramie Basin, it is a fairly straight, two-lane road with clearly marked passing zones. The speed limit for this section of U.S. 287 is 65 mph. There are two bridge crossings over the Union Pacific Railroad. 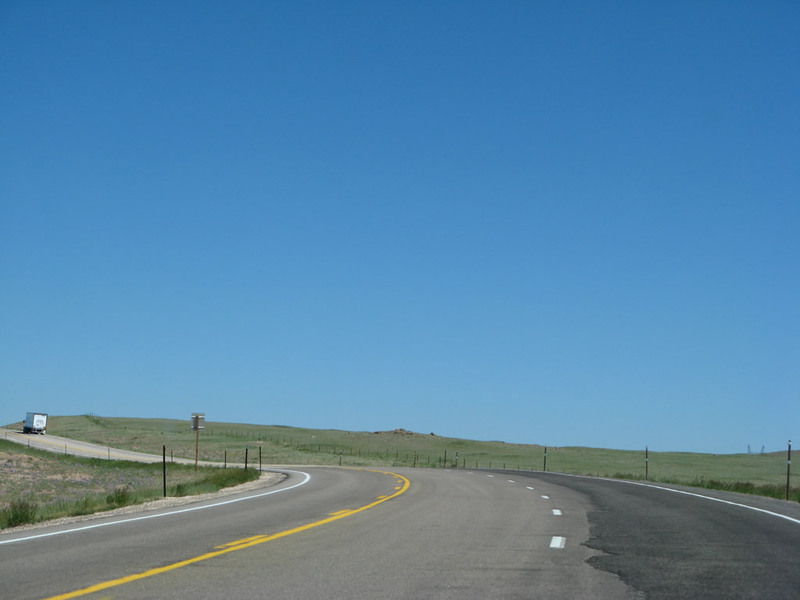 This segment of highway has its own set of mileposts unrelated to the whole mileage of U.S. 287 in Wyoming. In winter, this road is both desolate and dangerous. Ground blizzards are common, as the wind picks up the loose snow and blows it toward Nebraska. During the worst of the ground blizzards, it is impossible to see. We traveled this road one evening in late September, and we encountered a full blizzard. 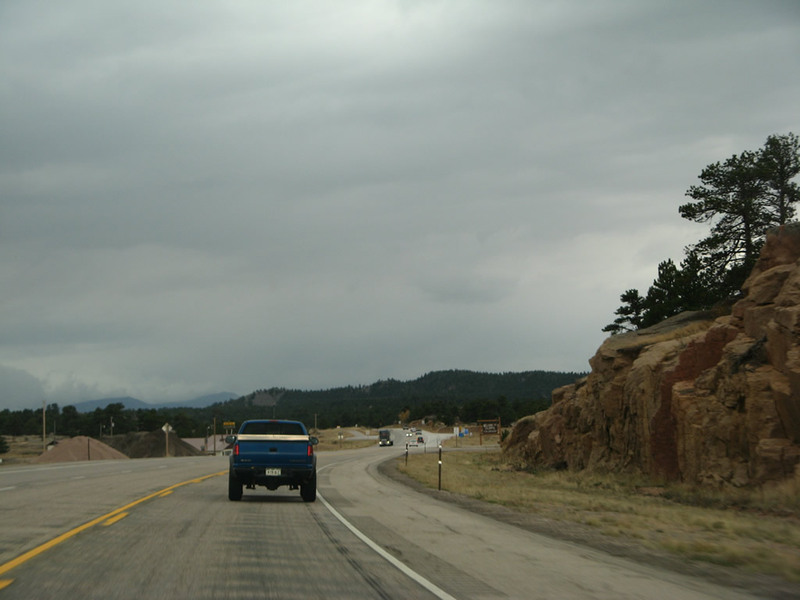 We were lucky to find a truck to follow all the way from the Wyoming-Colorado state line to Laramie. 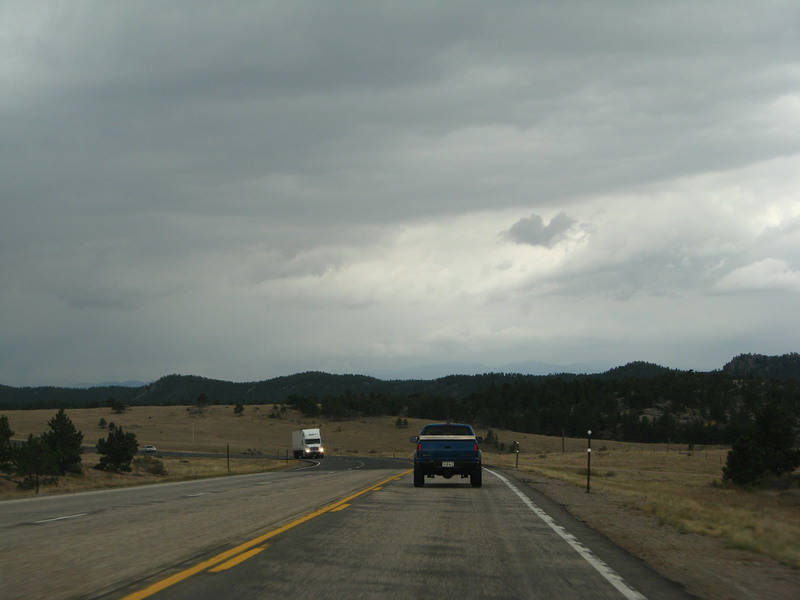 Once we arrived in Laramie, we were stranded, as the highway department closed the road behind us. 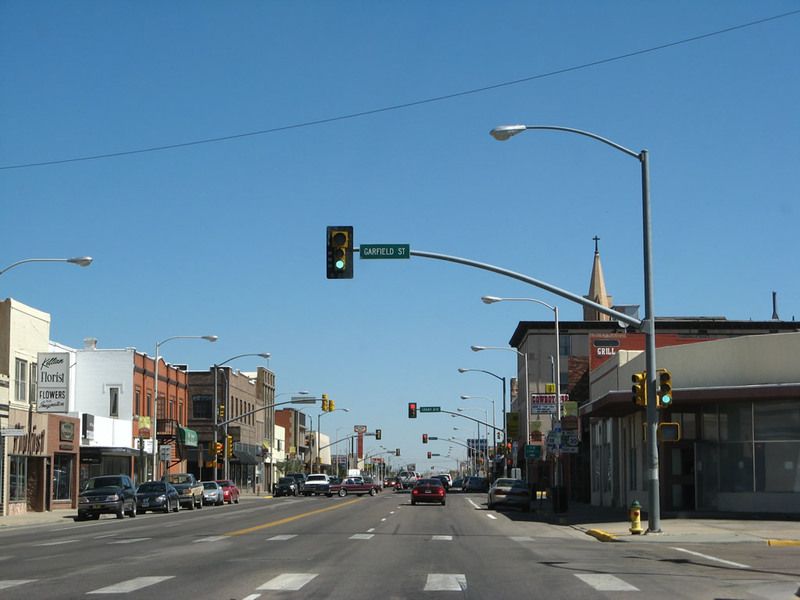 Upon reaching Laramie, U.S. 287 becomes Third Street and merges with Bus. Loop Interstate 80 and U.S. 30 near downtown. 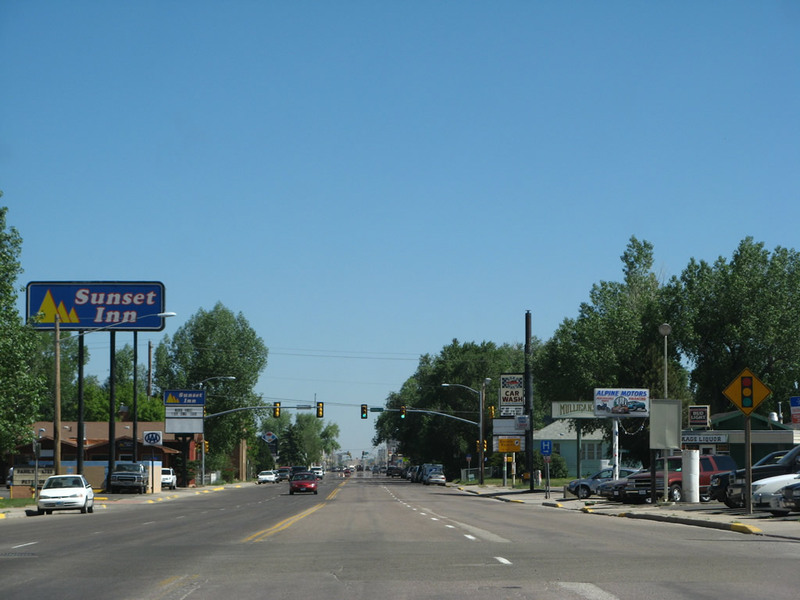 U.S. 287 provides a pretty good glimpse into Laramie: the south end near the interstate is built for travelers and tourists, the middle runs through downtown and provides access to the University of Wyoming, and the north end hits the grocery stores, K-Marts, and other shops typical of medium-sized Wyoming towns. Splitting off from Business Loop I-80 at the Curtis Street stoplight (the last stoplight you'll see heading northbound for quite a while), U.S. 30-287 goes due north toward Bosler, Rock River, and Medicine Bow. The mileposts on this section follow U.S. 30. 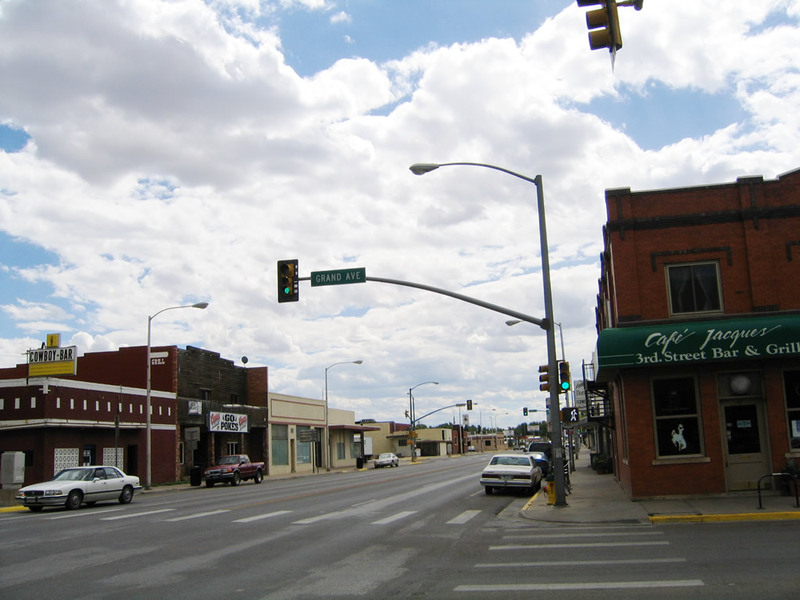 The Wyo Tech school is located just north of Laramie, and the tiny town of Bosler is about fifteen miles north of there. 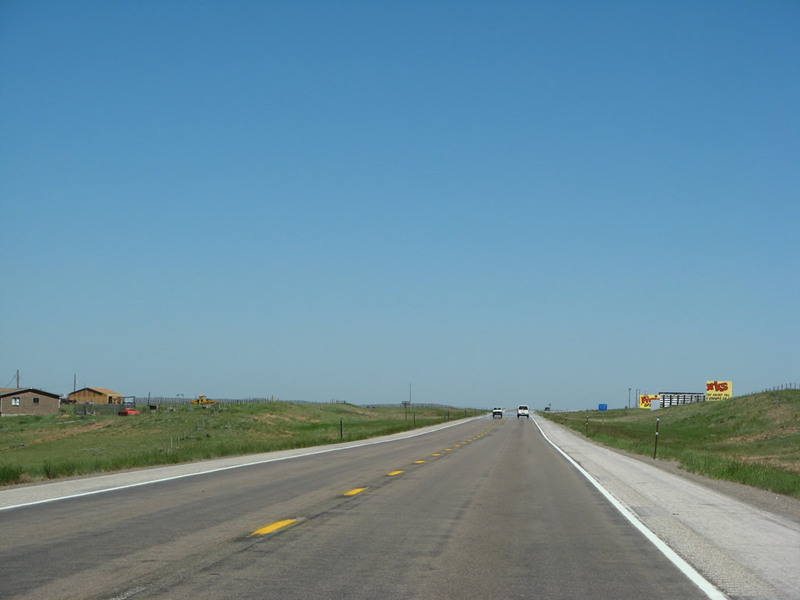 Right after the Wyoming 34 junction, the two-lane road becomes a four-lane freeway. This freeway continues all the way to Rock River. 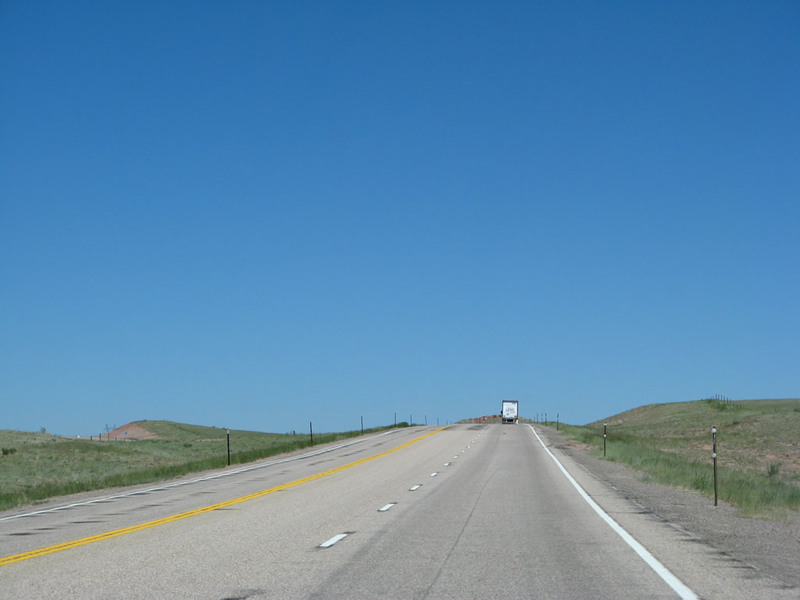 According to the Wyoming Department of Transportation, this section of U.S. 30-287 is the only significant piece of non-interstate four-lane highway in the state. It was built in the early 1960s to be the future Interstate 80, but it was never meant to be. Politicians wanted Interstate 80 to be routed along the old Overland Trail through Arlington and Elk Mountain so travelers could shave 16 miles off their trans-Wyoming trip. Never mind the fact that the weather is much worse along Interstate 80, and the Arlington section of the interstate is frequently shut down due to inclement weather. Before the interstate opened in 1970, U.S. 30-287 carried 3,600 vehicles per day. In 1995, the interstate carried 7,600 vehicles per day and U.S. 30-287 carried 650 vehicles per day. U.S. 30-287 turn northwest at Rock River and then due west at the Albany-Carbon County line. 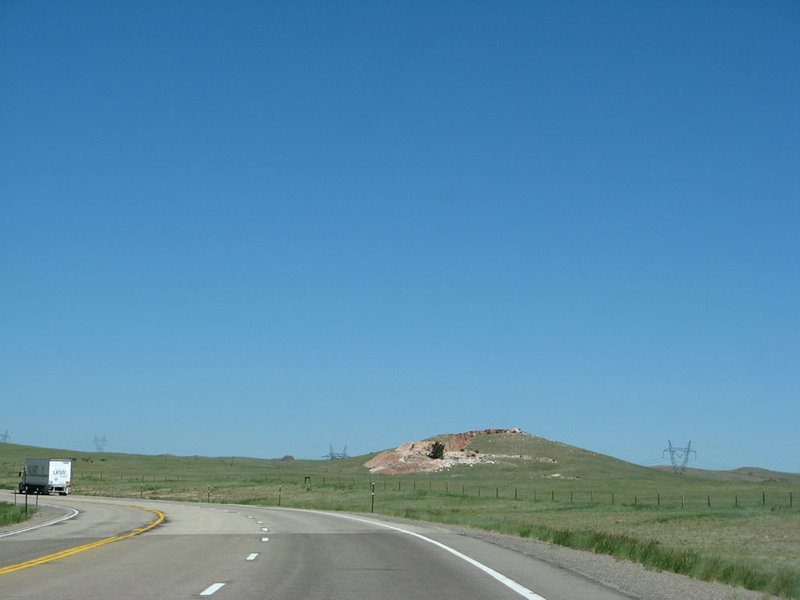 At the county line, look for Como Bluff, a large hill that runs in an eas-west direction nearly parallel to the highway. Geologists and paleontologists have found exciting dinosaur remains here, including a stegosaurus. There is a museum here. 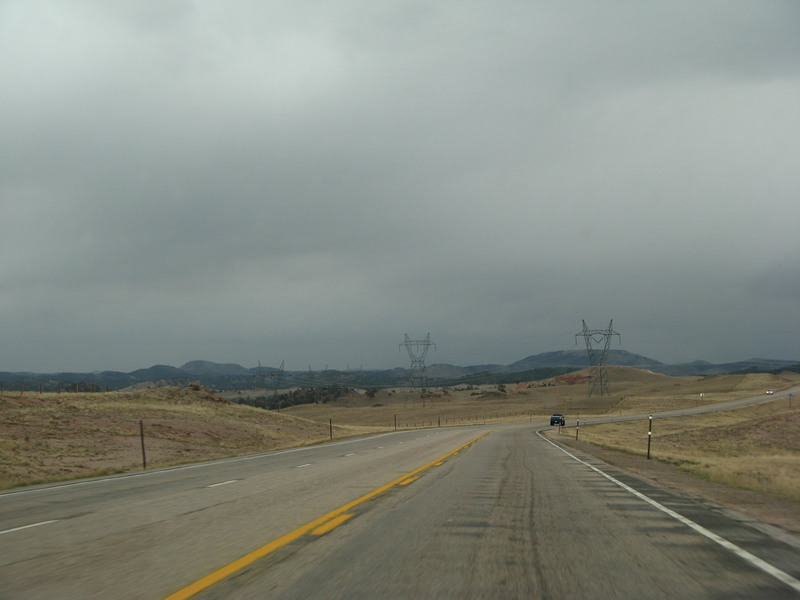 At Medicine Bow, there is a large wind turbine left over from a failed experiment. There used to be two turbines, but one was taken down, and the other does not work as it needs repair. However, with the recent increase in the number of wind turbines (especially near Arlington on Interstate 80), additional turbines are planned in this location. Medicine Bow is the town immortalized in Owen Wister's The Virginian. At this point, U.S. 30-287 turn southwest to rejoin the interstate. 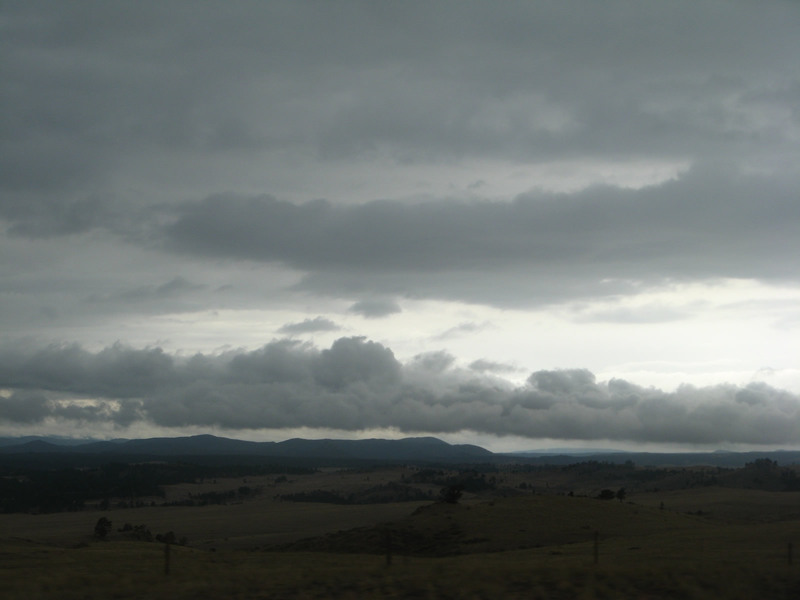 Near Hanna, the highway passes by several active and inactive coal mines. Upon rejoining Interstate 80, U.S. 30-287 are absorbed into the massive truck traffic flowing from coast-to-coast. 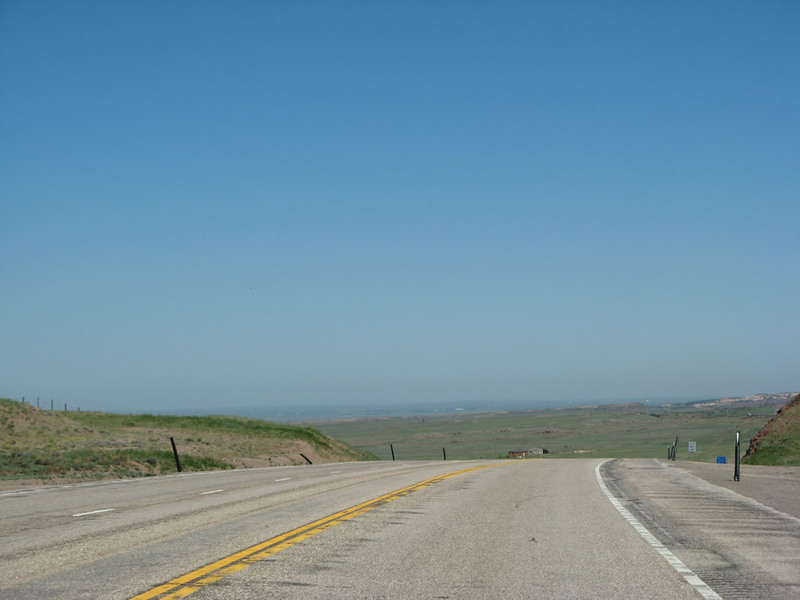 You can see remnants of the original Lincoln Highway along the Interstate near Fort Steele Junction (Interstate 80 Rest Area). Then the old road, unmarked, exits at East Sinclair. Old U.S. 30-287 went through Sinclair (formerly Grenville, later Parco), then provides an alternate route into east Rawlins via Wyoming 76. At Rawlins, U.S. 287 splits from the interstate and U.S. 30. There is a short bypass that allows travelers to avoid the downtown area and continue on to their destinations. U.S. 287 goes due north from Rawlins to Muddy Gap, then turns northwest from there to Moran Junction. 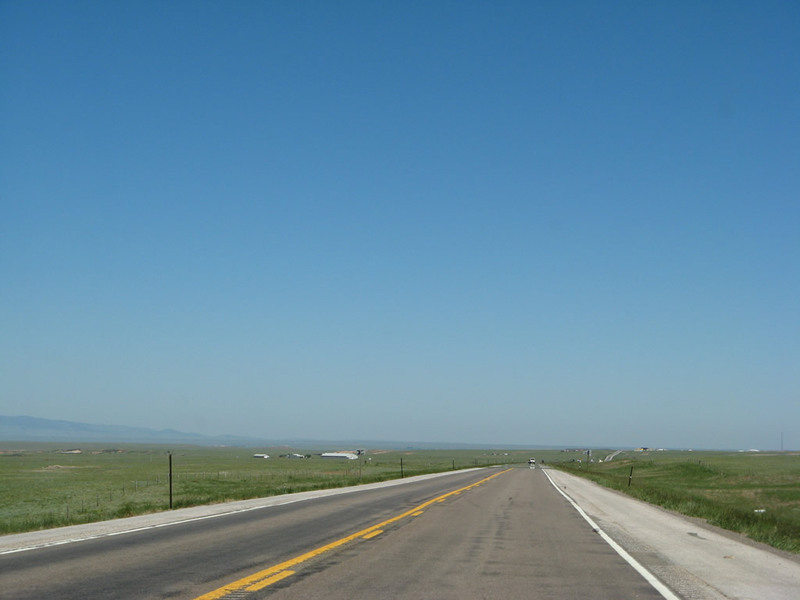 U.S. 287 is paired with Wyoming 789 from Rawlins north to Lander. 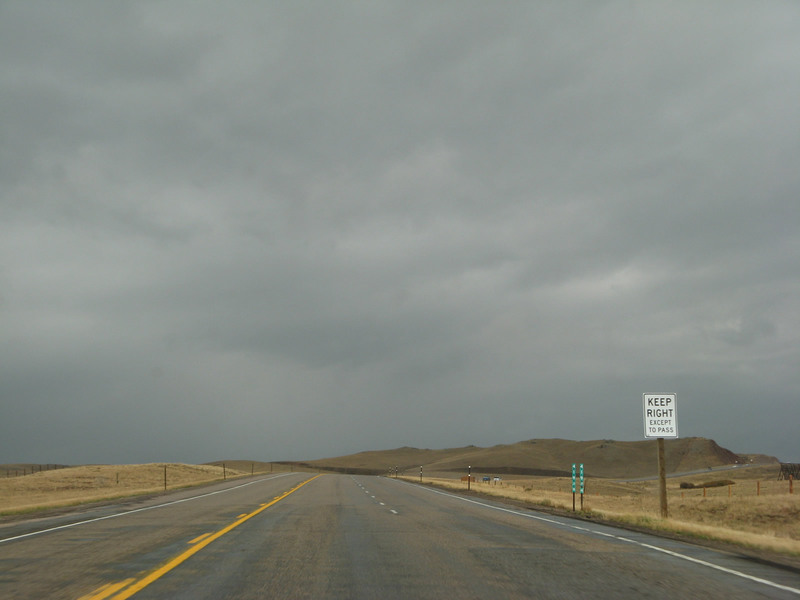 Wyoming 789 is a north-south highway that bisects the state. 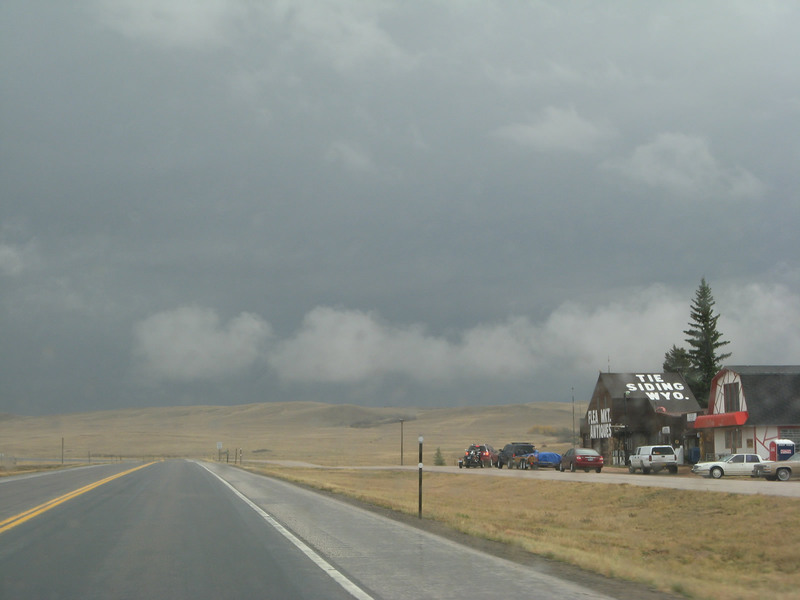 About seven miles north of Rawlins, U.S. 287 and Wyoming 789 cross the Continental Divide at 7,245 feet. 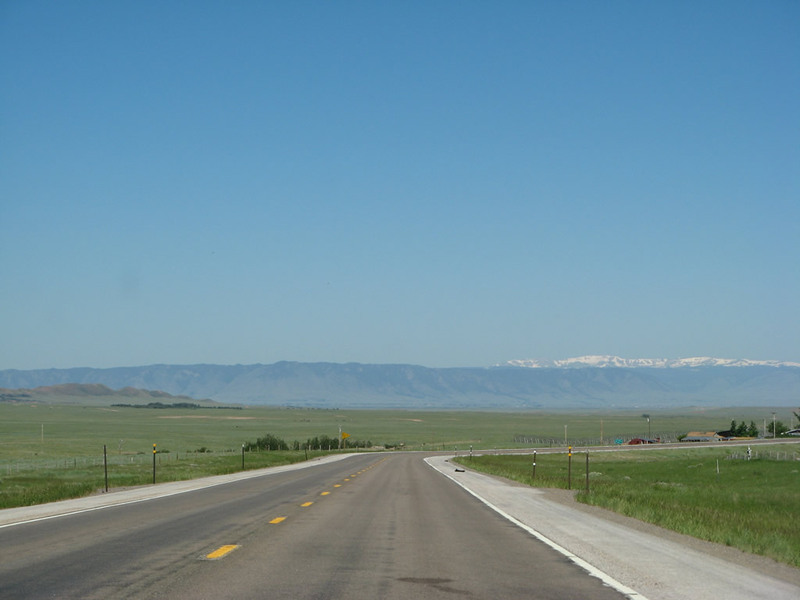 The highway stays on the Great Divide Basin side until just north of Lamont, where U.S. 287 and Wyoming 789 reenter the Atlantic Ocean drainage. The mileposts begin at the number "one" in Rawlins and increase northwestward to Moran Junction. 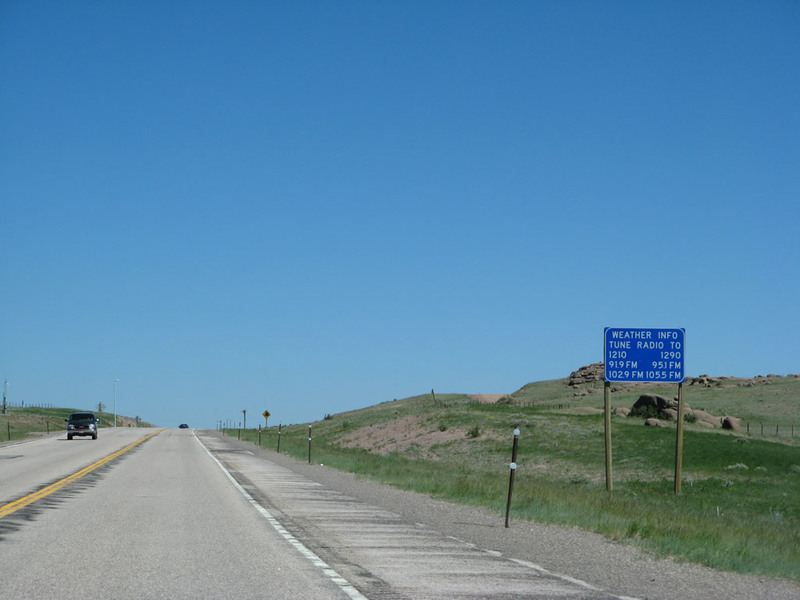 The U.S. 287 and Wyoming 220 route combination is a major route for travellers from Interstate 80 (southwestern Wyoming and Salt Lake City) to Casper and Rapid City. 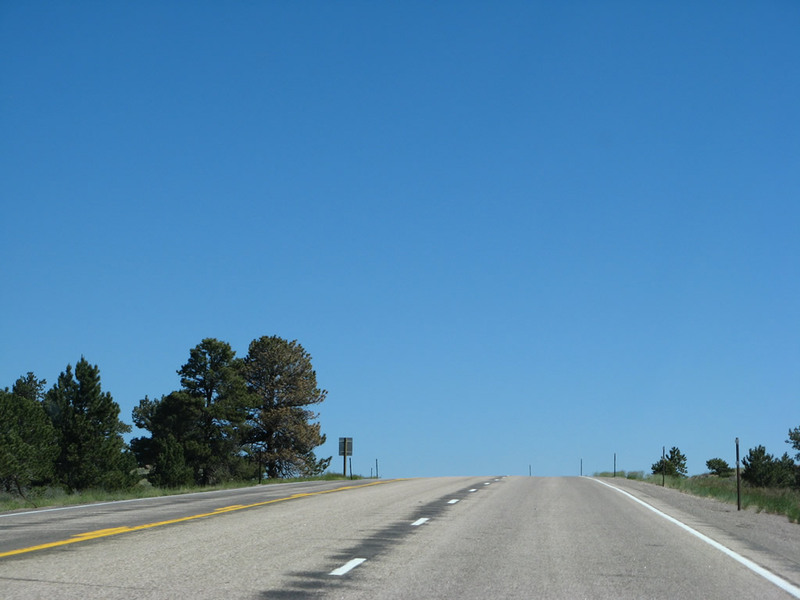 Wyoming DOT has thought about around widening U.S. 287 and Wyoming 220 so it would be safer for the sometimes dangerous mix of tourists and trucks. 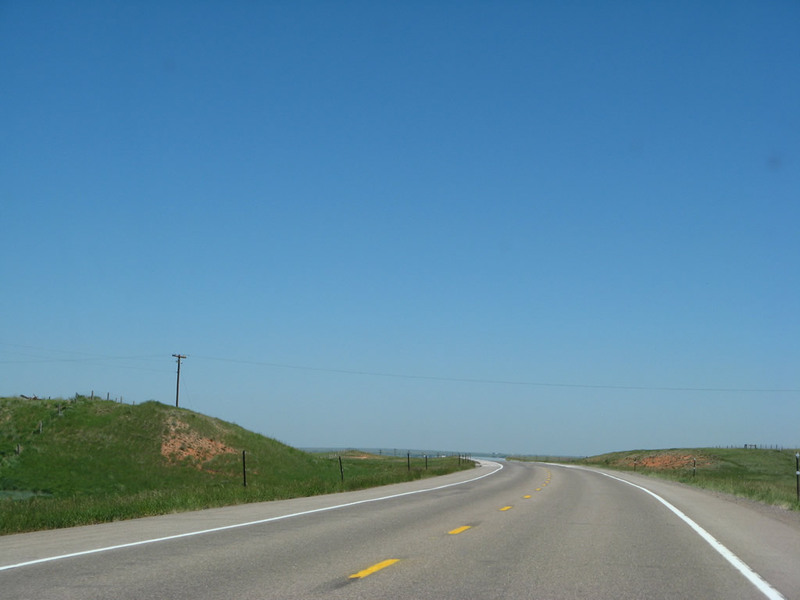 In fact, some have argued for a complete four-lane highway between Rawlins and Casper. In any case, the U.S. 287 traffic tapers off at Muddy Gap (where Wyoming 220 turns northeast to Casper). 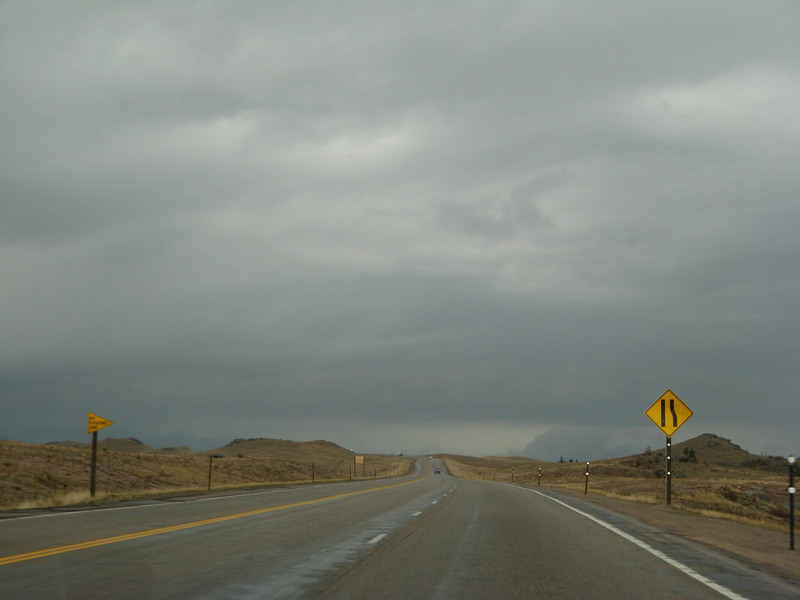 Northwest of Muddy Gap, U.S. 287 and Wyoming 789 go some 20 miles to Jeffrey City and another 20 miles to Sweetwater Station. 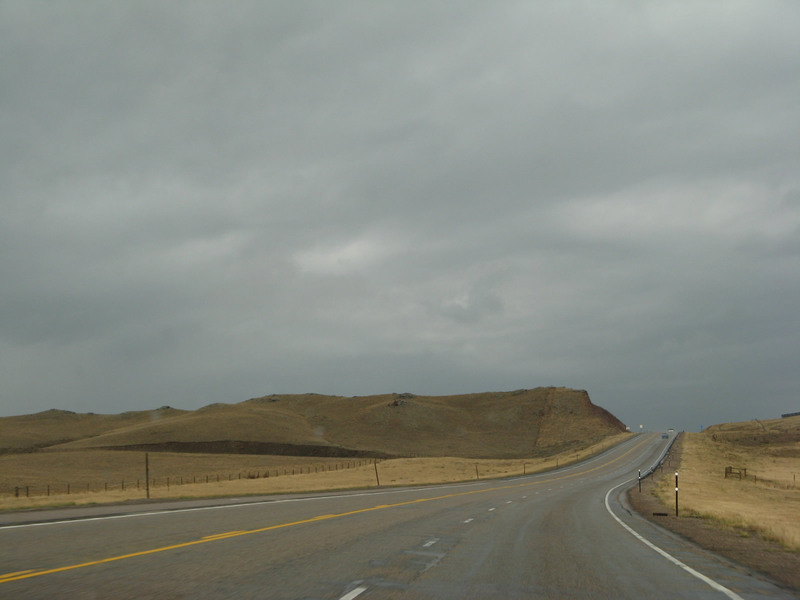 The portion of U.S. 287 from Muddy Gap to Sweetwater Station is part of the historic Oregon Trail. Then, you drop off the Beaver Rim in a series of easy curves and run about 40 miles over to Lander, providing a gorgeous view of the Wind River Mountains. 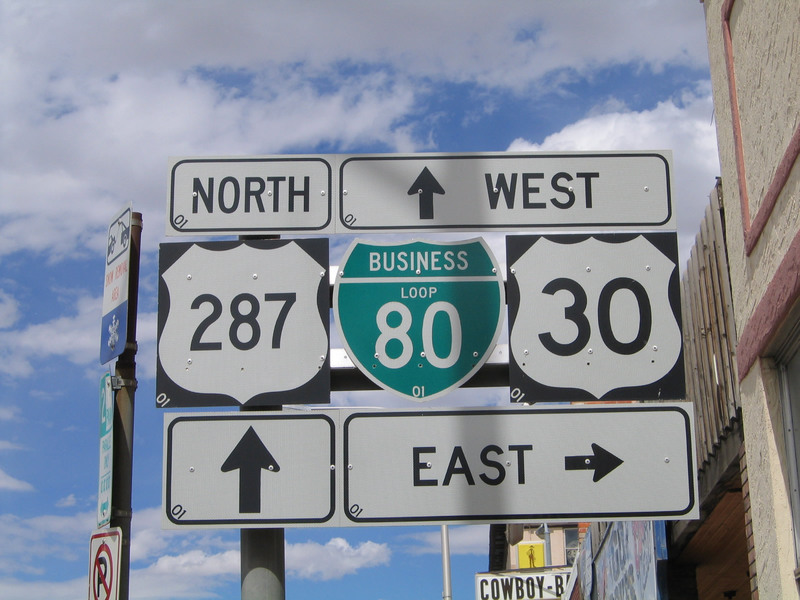 At Lander, Wyoming 789 splits to the north and Riverton, while U.S. 287 continues northwest. Sinks Canyon State Park, where the Popo Agie River disappears, is near U.S. 287 via Wyoming 131. From Lander, you have about 75 miles to Dubois. The first third of this route is over some rolling hills, and the rest of U.S. 287 parallels the Wind River. U.S. 287 rides solo from Lander to Diversion Dam Junction, then merges with U.S. 26. U.S. 26-287 goes through the Wind River Indian Reservation to get to Dubois and the Togwotee Pass. U.S. 287 passes through Crowheart, a tiny community along U.S. 287 in the Wind River Indian Reservation. The town of Dubois looms just ahead. It is properly pronounced "DO-BOYS" in Wyoming, so don't confuse it with the pronunciation of the French word DuBois ("DO-BWAH"). The highway crosses Togwotee Pass (9,658 feet) in the Shoshone National Forest and comes out in Moran Junction. This is beautiful land, just waiting to be hiked. 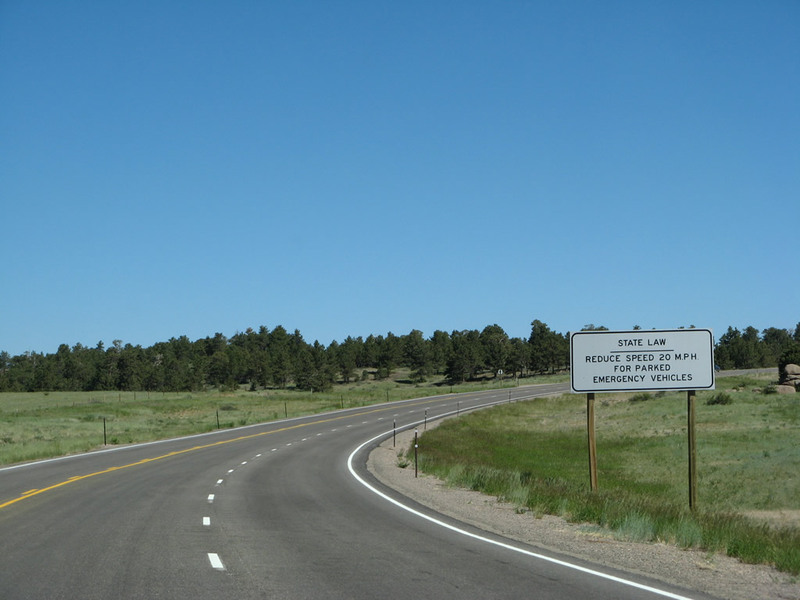 Now U.S. 287 is in the Pacific Ocean watershed, as the Togwotee Pass marks the Continental Divide. 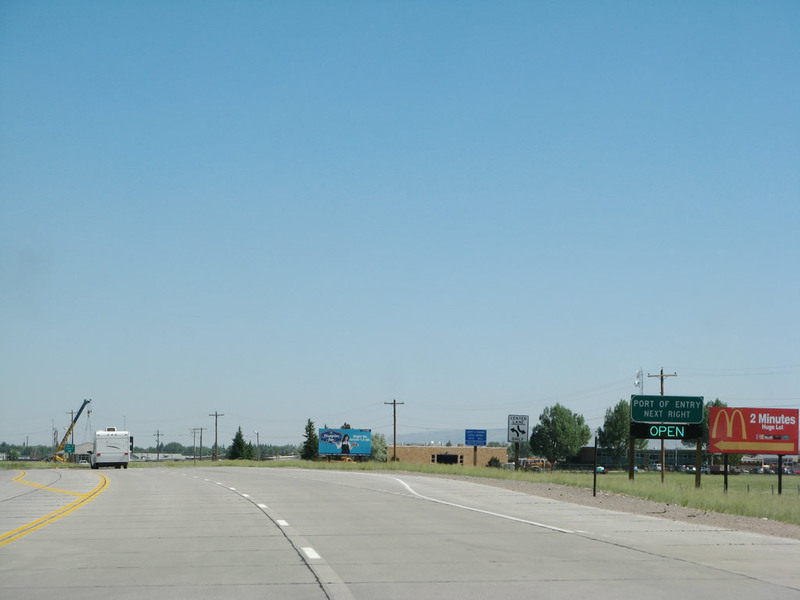 U.S. 26 splits off U.S. 287 at Moran Junction, while U.S. 89 and 191 merge with U.S. 287 heading north to Jackson Lake and the John D. Rockefeller Memorial Parkway. 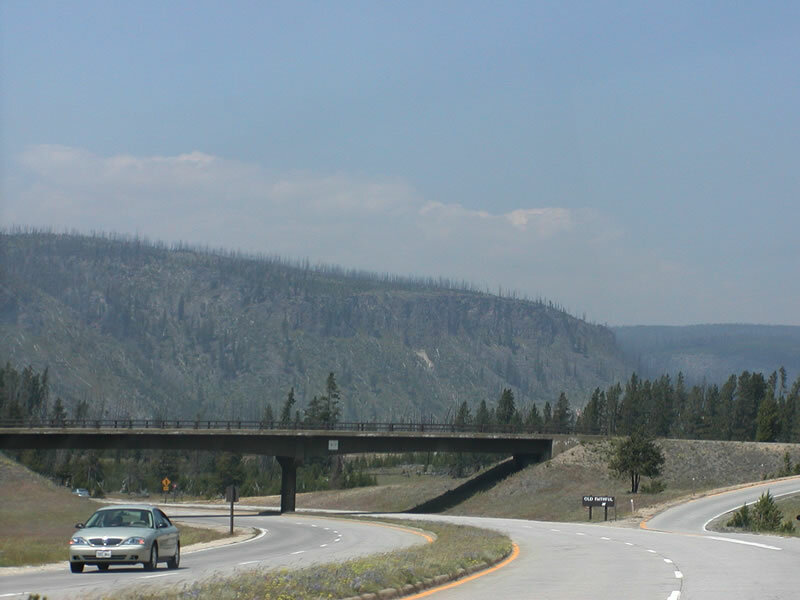 At this point, U.S. 287 enters Yellowstone National Park and comes to an end. It resumes in West Yellowstone, Montana, merged with U.S. 20 and U.S. 191. 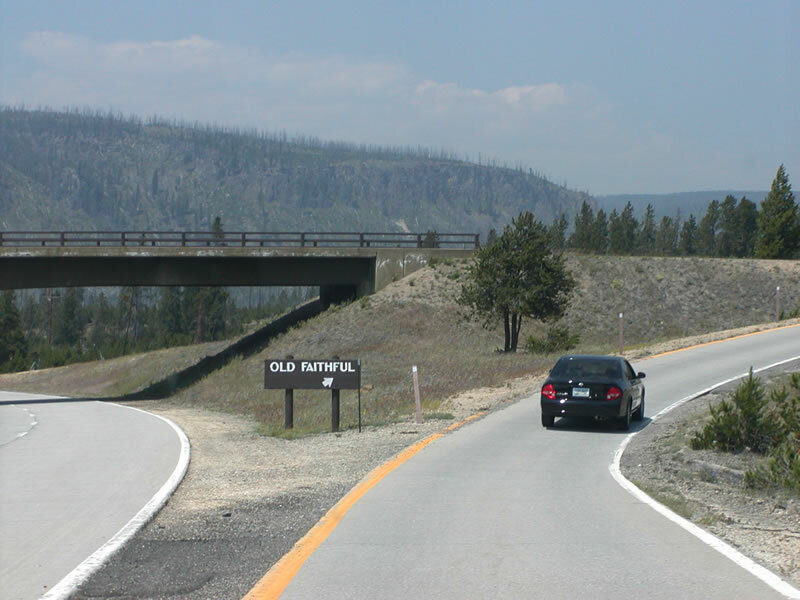 AASHTO recognizes the Yellowstone National Park section as an "official gap" in U.S. 287. For more on the undesignated Yellowstone National Park section, go to the Grand Loop Road guide. 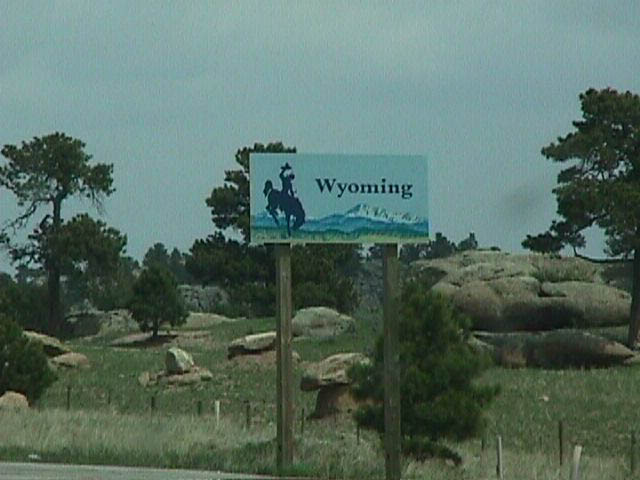 Still in Colorado, the state line with Wyoming is noticeable due to the change in asphalt color. A small turnout is located on the east side of the highway for a Wyoming historical marker for the Overland Trail crossing. The Overland Trail, which served as an alternative to the California, Mormon, and Oregon Trails to the north, generally stayed in southern Wyoming and northern Colorado. It reached its greatest popularity in the 1850s and 1860s. In Wyoming, the trail entered the state near here and extended northwest into the Laramie Basin and then past Elk Mountain to cross the Red Desert en route to join the Oregon Trail at Fort Bridger in southwestern Wyoming. It was in use until the transcontinental railroad replaced it in 1869. Photo taken 06/30/08. 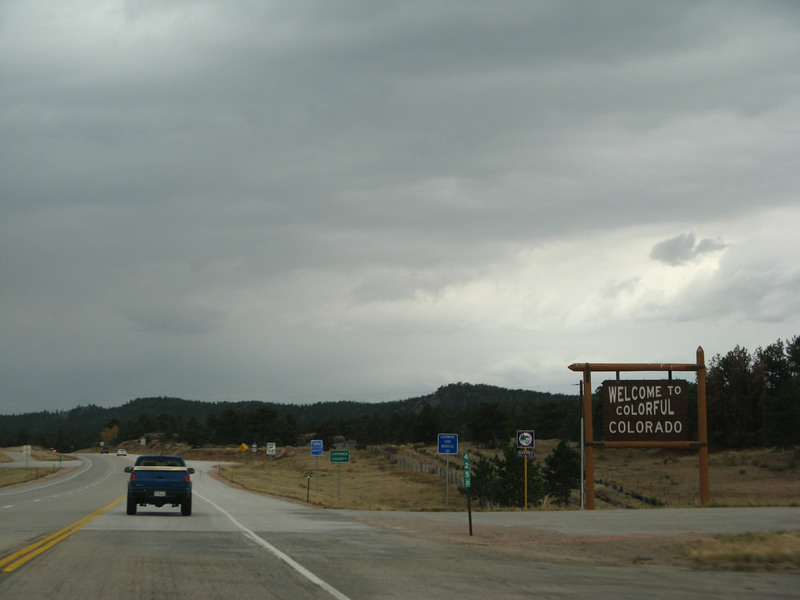 Northbound U.S. 287 leaves Colorado and enters the Equality State of Wyoming. When we visited in 2010, the welcome sign had gone missing. Photo taken by Michael Ballard, 8/98. 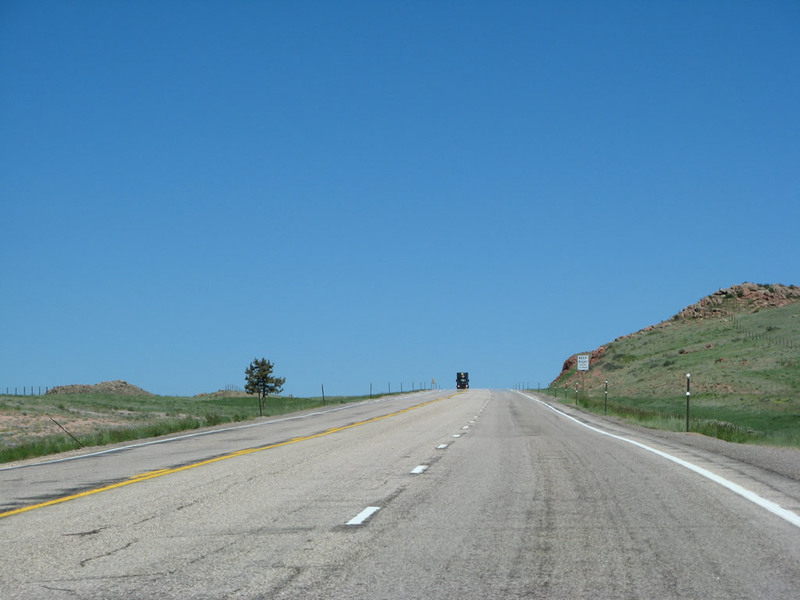 U.S. 287 leaves Colorado and enters Wyoming as a three-lane highway with two lanes northbound; it will ascend from here to the 8,106-foot summit of Pumpkin Vine Hill. 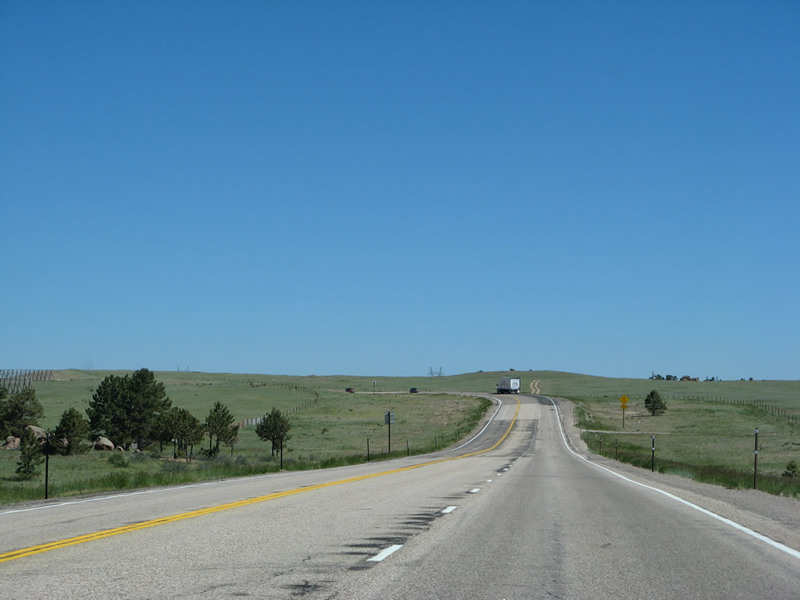 Once in Wyoming, the middle lane is considered a "suicide" lane because it may be used by either direction of traffic legally. 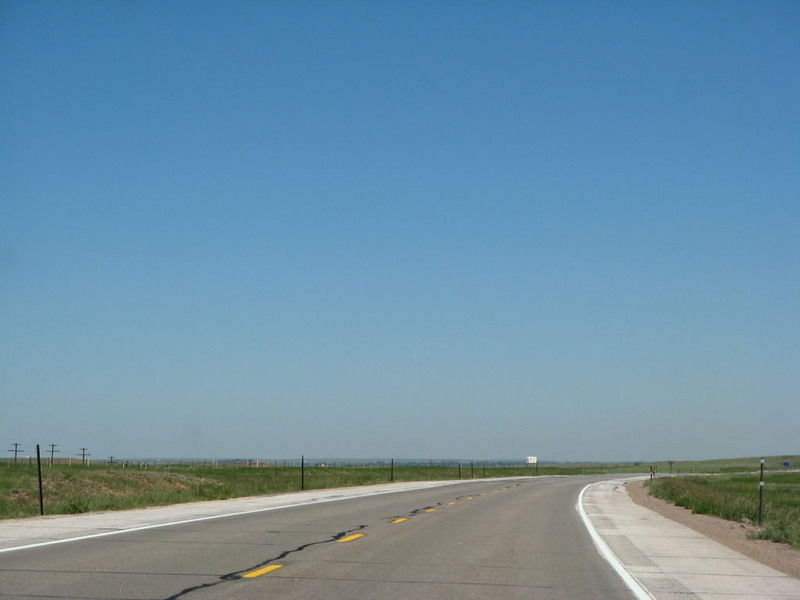 A feasibility study released in 2002 determined that U.S. 287 between the Colorado State Line and Laramie should be four lanes with a median. Portions of the route have been upgraded to this standard during the 2000s and 2010s. Photo taken 06/30/08. The first reassurance route marker for U.S. 287 north is posted soon thereafter; this sign features fairly small numerals, making it difficult to read when passing at high speeds. 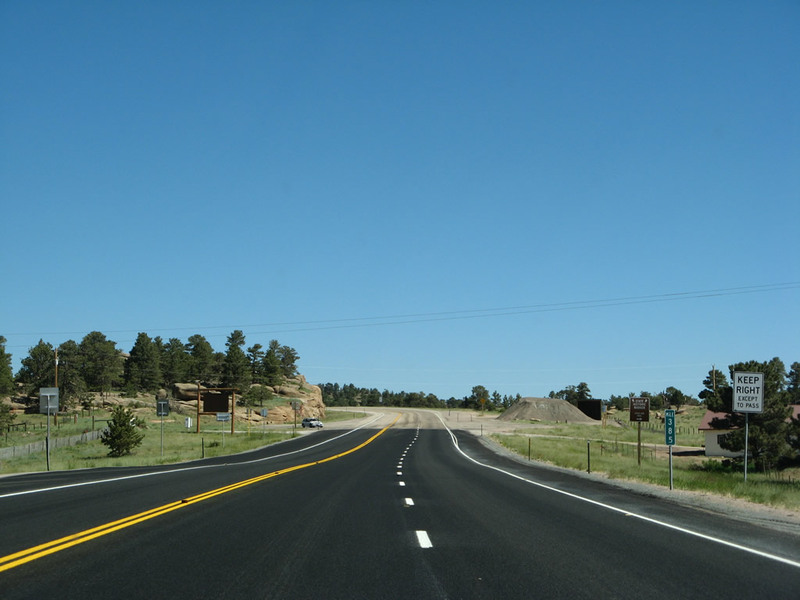 Work to expand this segment of U.S. 287 to four lanes with wide median was underway in summer 2014; we'll return to get pictures of the improved roadway. Photo taken 06/30/08. 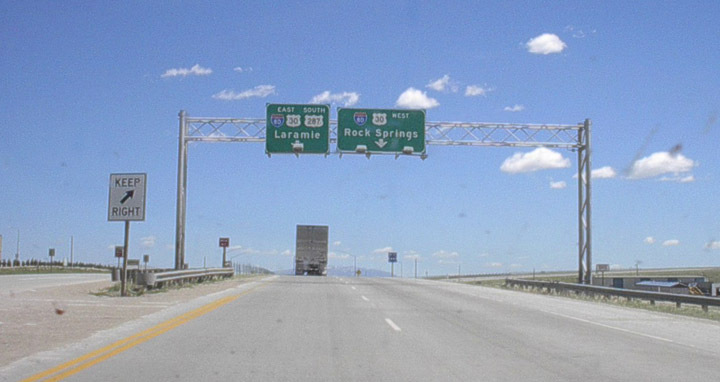 This mileage sign along U.S. 287 north provides the distance to Laramie (25 miles) and Rawlins (124 miles). 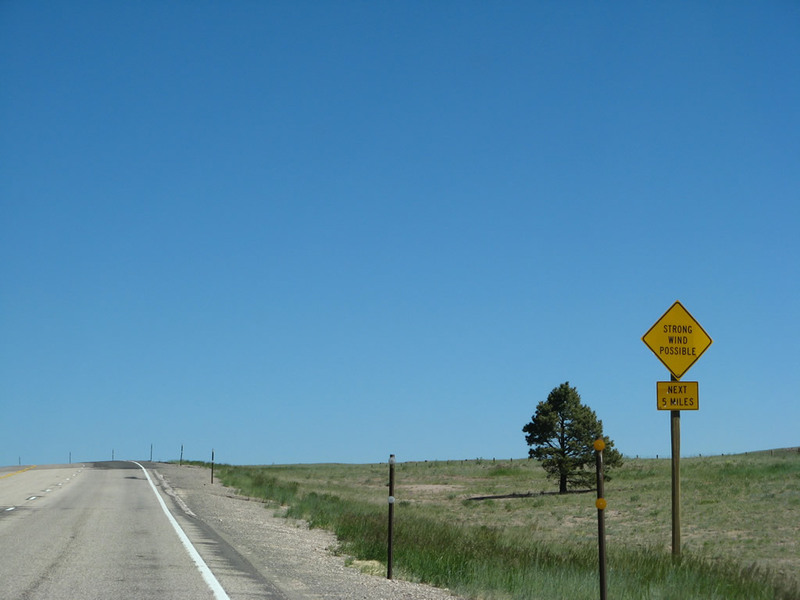 Omitted is the distance to tiny Tie Siding, which is located at the point where the Union Pacific Railroad descends west from the Laramie Mountains and curves north to follow U.S. 287 north into Laramie. Photo taken 06/30/08. 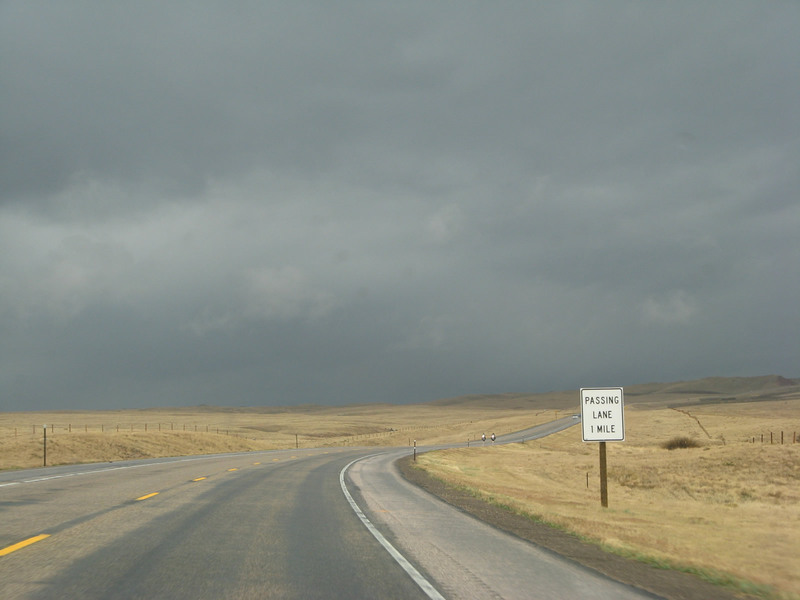 Due to the combination of a two or three-lane highway, rural traffic speeds, limited development, open spaces, and sometimes dangerous wind conditions, U.S. 287 sees a headlights-required section for 20 miles. As noted above, portions of U.S. 287 are being slowly developed into four-lane expressway with a full median. Such improvements will greatly enhance safety along the roadway. Photo taken 06/30/08. 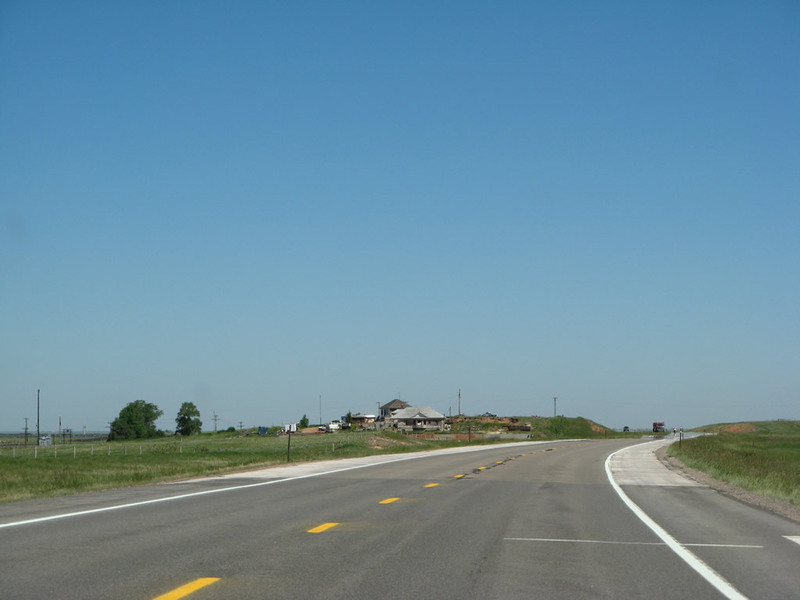 U.S. 287 continues north as a three-lane highway. A regulatory sign advises motorists of the state requirement that vehicles must move over or reduce speed when approaching parked emergency vehicles on the side of the highway. Photo taken 06/30/08. 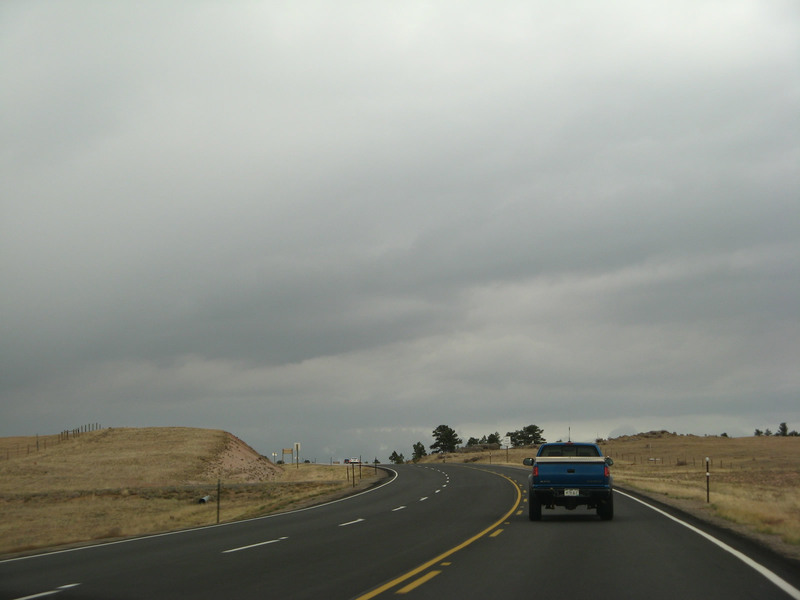 This series of pictures follows U.S. 287 north along the crest as we approach the summit of Pumpkin Vine Hill. Sight lines vary considably along this stretch, requiring motorists to use caution when passing in a blind area. 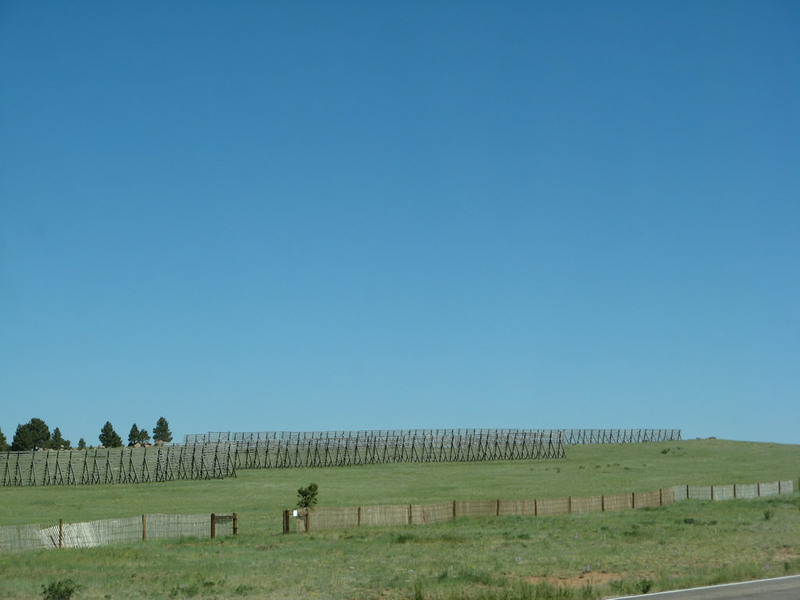 Snow fences, designed to reduce wind speeds enough to cause blowing snow to drop behind a fence, become increasingly common as the viewshed gradually expands. 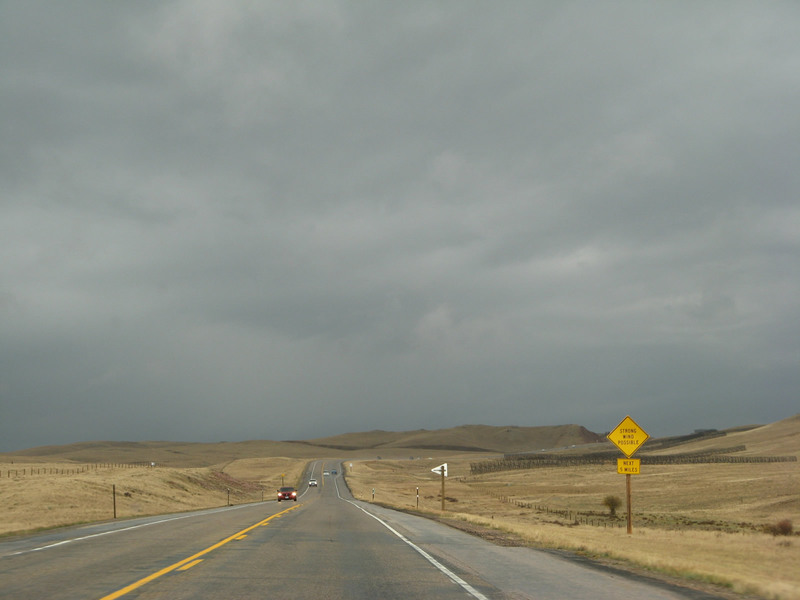 Watch for sudden wind gusts on this often-windy stretch of remote highway. Photos taken 06/30/08. 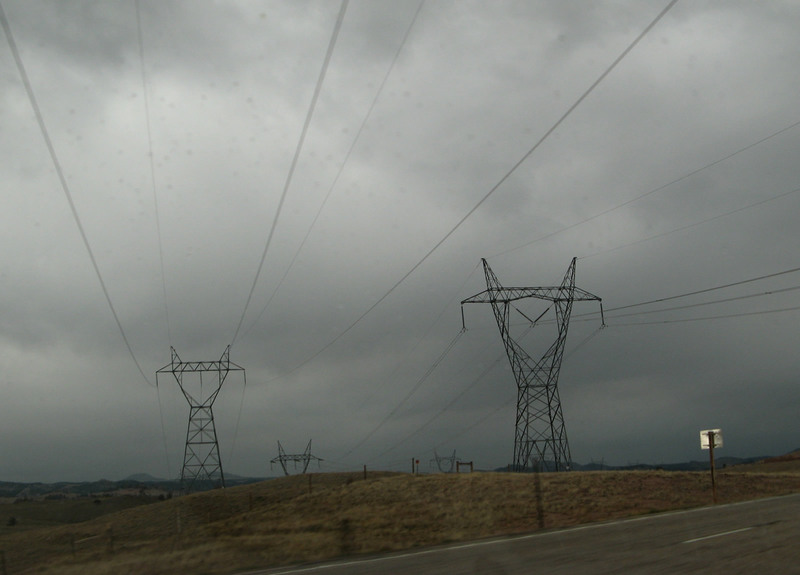 A set of major power lines cross over U.S. 287. Bringing power from some major coal-fired power plants located near Craig, Colorado, these lines travel to and serve the Front Range area of Colorado as well as connecting to Cheyenne's power grid. 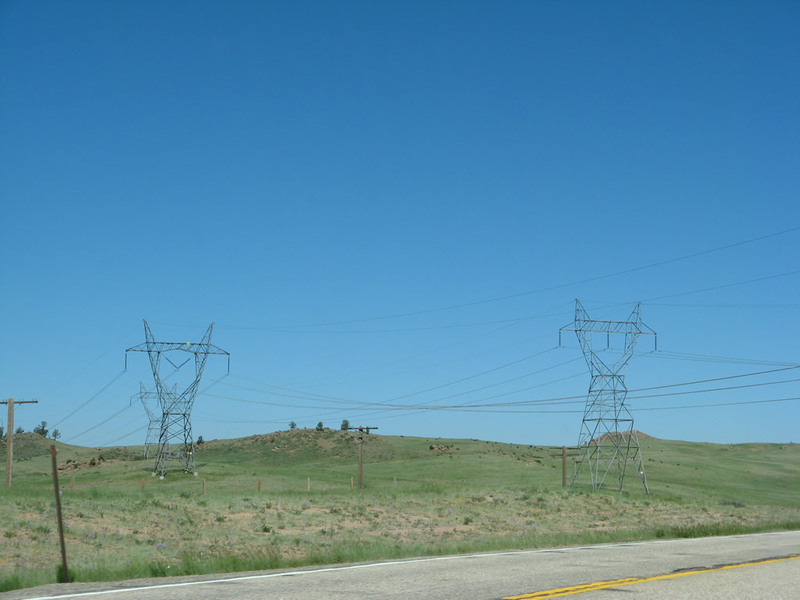 The larger of the two single-circuit lines is set at 345kV. Photos taken 06/30/08. 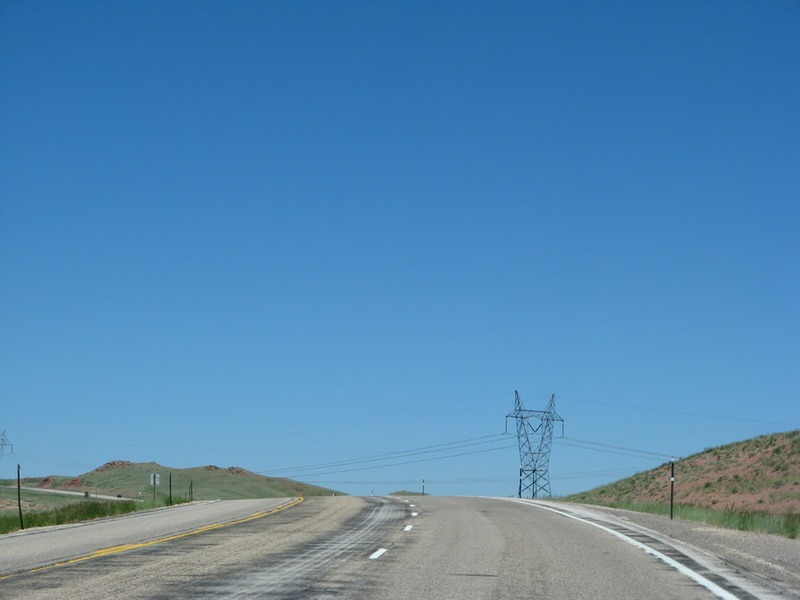 U.S. 287 passes under the two sets of power lines and continues to ascend to the summit of Pumpkin Vine Hill, elevation 8,106 feet above sea level. 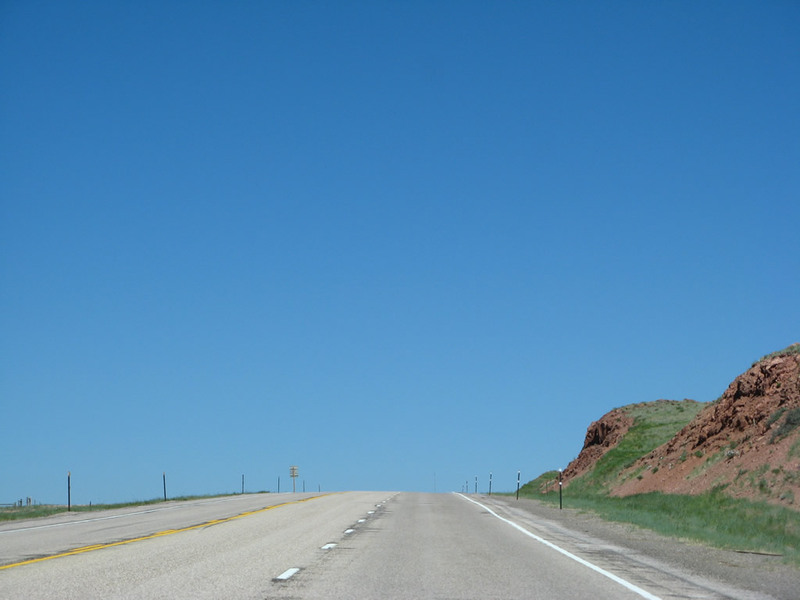 After reaching this height, U.S. 287 will descend into the Laramie Basin and widen to a four-lane expressway configuration. Photos taken 06/30/08. At the top of the grade, U.S. 287 reaches Pumpkin Vine Hill. 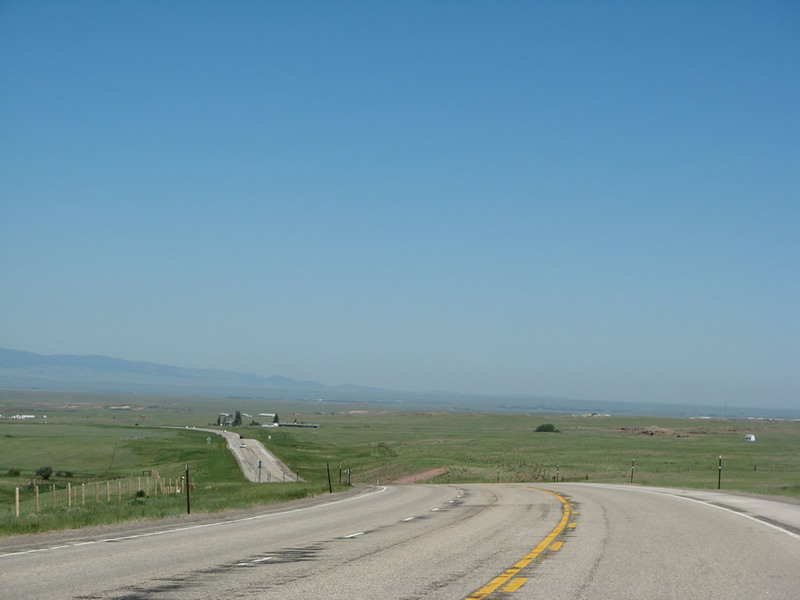 Albany County Route 241, an unpaved road, departs U.S. 287 and follows Pumpkin Vine Hill Road east to connect with Albany County Route 234 and Laramie County Route 206 en route to Interstate 80 and U.S. 30 Exit 339 in the Laramie Mountains. This route is not advisable without local guidance. 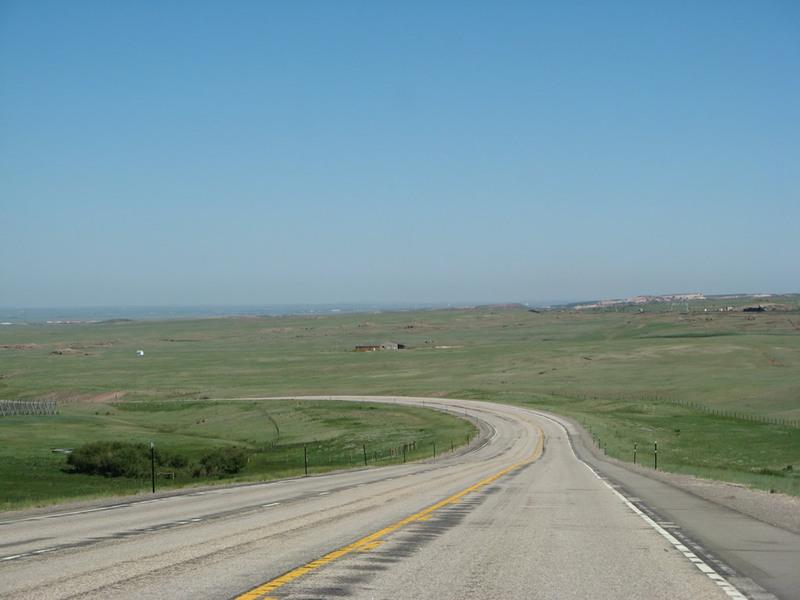 Ahead, U.S. 287 will begin a long descent into the Laramie Basin. Photos taken 06/30/08. Descending from the summit of Pumpkin Vine Hill, U.S. 287 widens to a four-lane expressway configuration. When we passed through here in 2008, the widening had not yet reached this far south, so our pictures show the old, two-lane configuration. However, by 2013, the highway had been widened to a four-lane expressway complete with center median barrier north of Pumpkin Vine Hill. 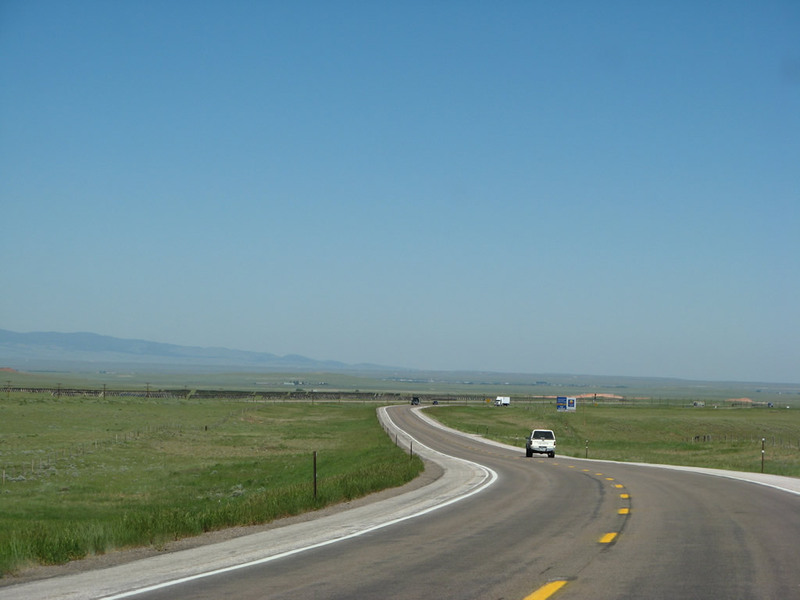 According to the U.S. 287 Laramie, Wyoming, to Colorado State Line (FHWA-WY-FONSI-07-01) Finding of No Significant Impact (2007), "The existing lanes would serve as the two southbound lanes for the improved roadway while the two northbound lanes would be built east and 76 feet from the existing lanes." 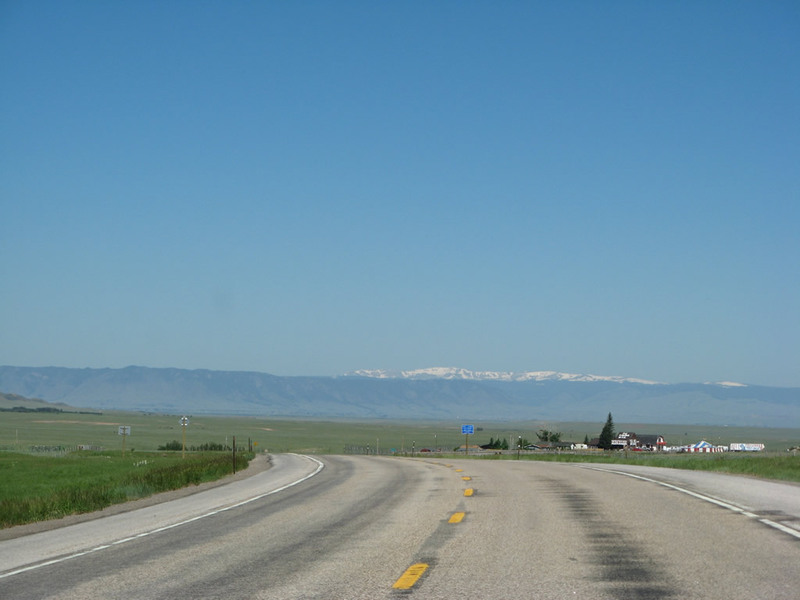 To the west, the Medicine Bow Mountains (better known as the Snowy Range) come into view along U.S. 287 for the first time. Photos taken 06/30/08. Nearing the bottom of the Pumpkin Vine Grade, northbound U.S. 287 approaches the small, unincorporated community of Tie Siding. A post office, fireworks, antiques, and flea market are advertised on the buildings here. 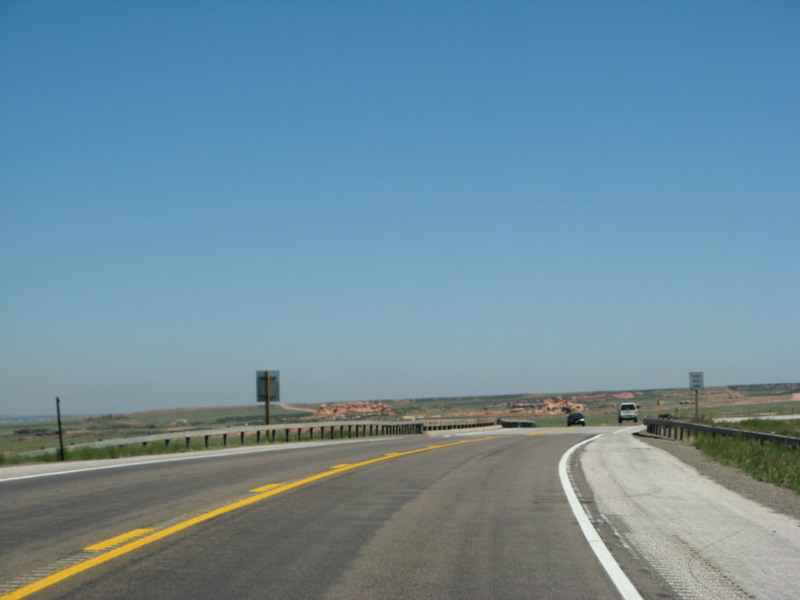 A small frontage road connects U.S. 287 to Tie Siding. Wikipedia pegs the elevation here at 7,694 feet above sea level, but there are no signs advising motorists of that. The Union Pacific Railroad -- part of the transcontinental railroad that changed this area signficantly with its arrival in 1869 -- comes into the area from the east and curves north to follow U.S. 287 for the final distance to Laramie. Photos taken 06/30/08. 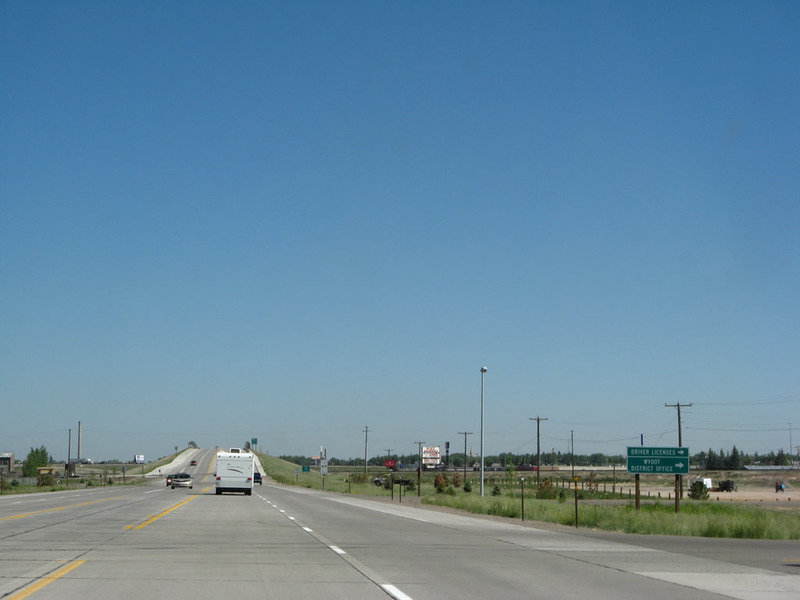 While these pictures show U.S. 287 as a two-lane highway, it has since been expanded to a four-lane expressway complete with 76-foot wide median barrier. 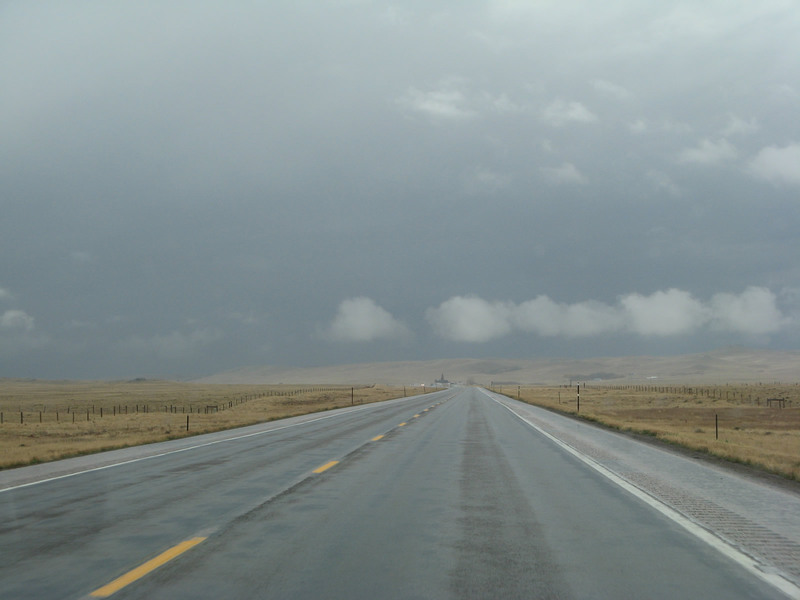 The highway will continue northwest toward Laramie. 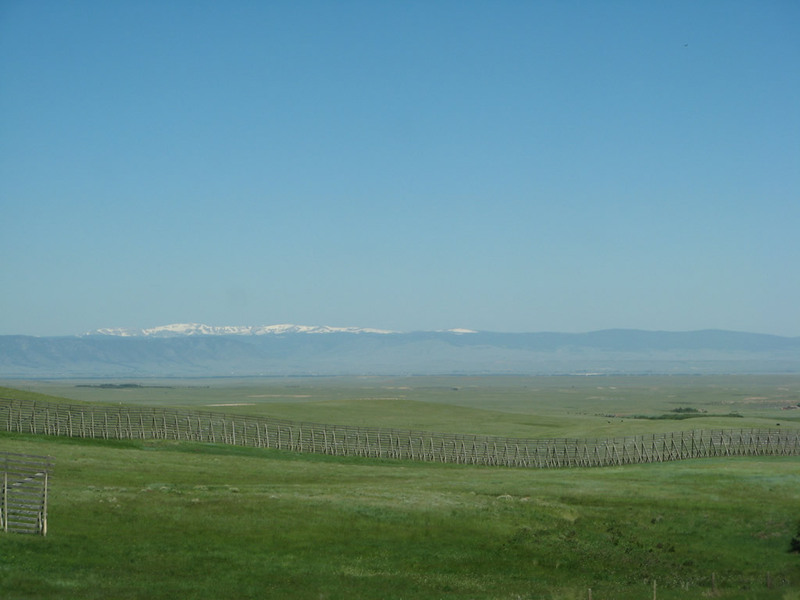 Now on the floow of the Laramie Basin, we see a semi-arid high plain with rolling hills and green grass, which was a function of a wet spring in 2008. 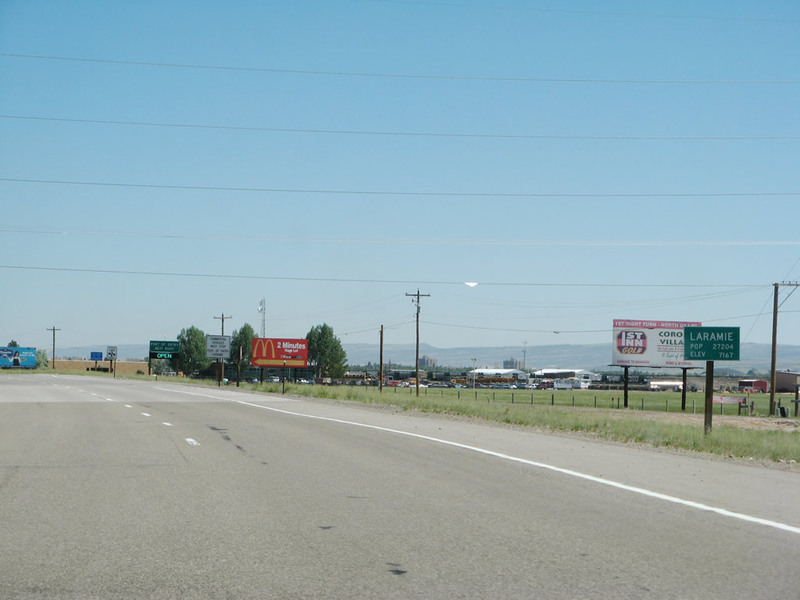 Billboards for fireworks are common along this segment of U.S. 287, since the sale of fireworks is legal in Wyoming and restricted in Colorado. Toward the end of this set, U.S. 287 crosses over the Union Pacific Railroad tracks. This bridge has since been twinned to allow for the new expressway to pass over the railroad. Photos taken 06/30/08. 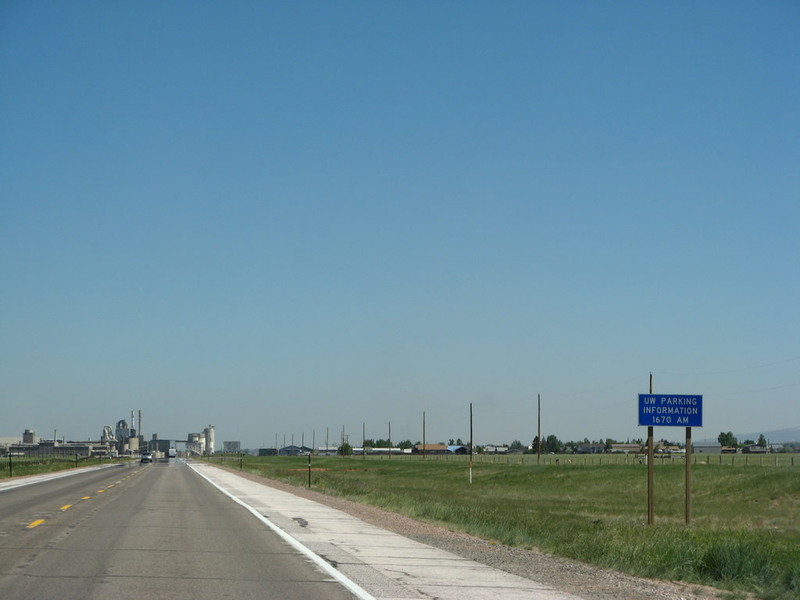 Civilization begins to appear as U.S. 287 proceeds north into the outskirts of Laramie. 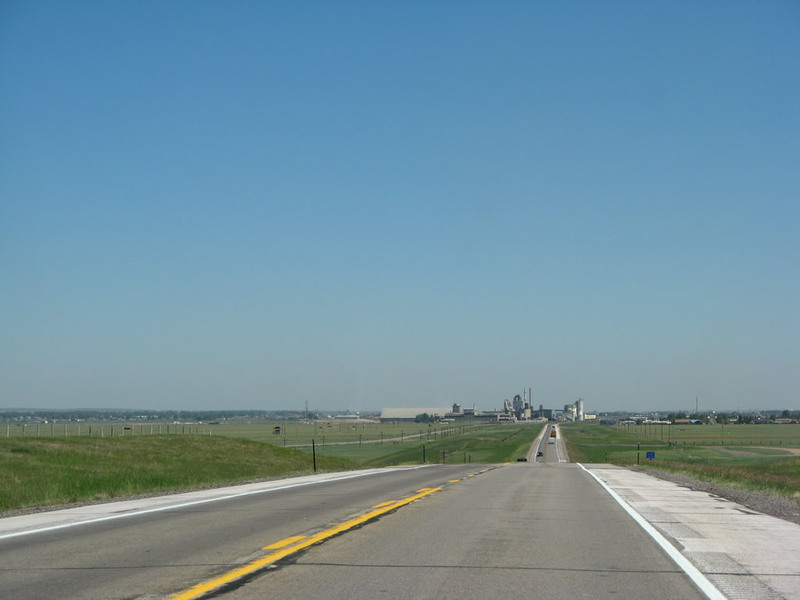 Ranches, solitary houses, and eventually industrial activity increases as U.S. 287 gets closer to the Gem City of the Plains. Photos taken 06/30/08. 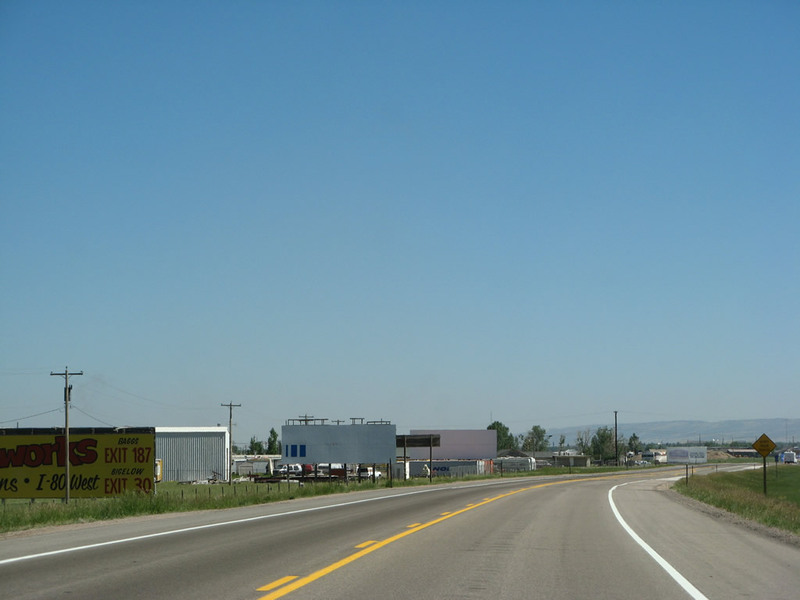 Once past the concrete plant, U.S. 287 approaches the State of Wyoming Port of Entry (weigh station) for commercial vehicles. 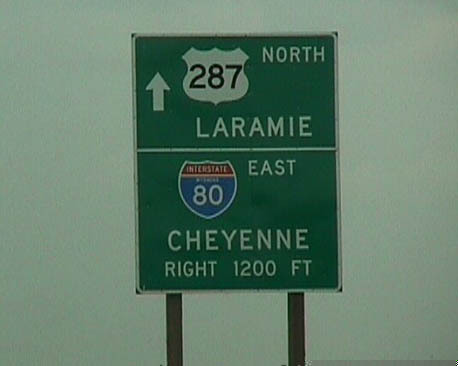 At the end of this series, U.S. 287 enters the city of Laramie ("The Gem City of the Plains"). 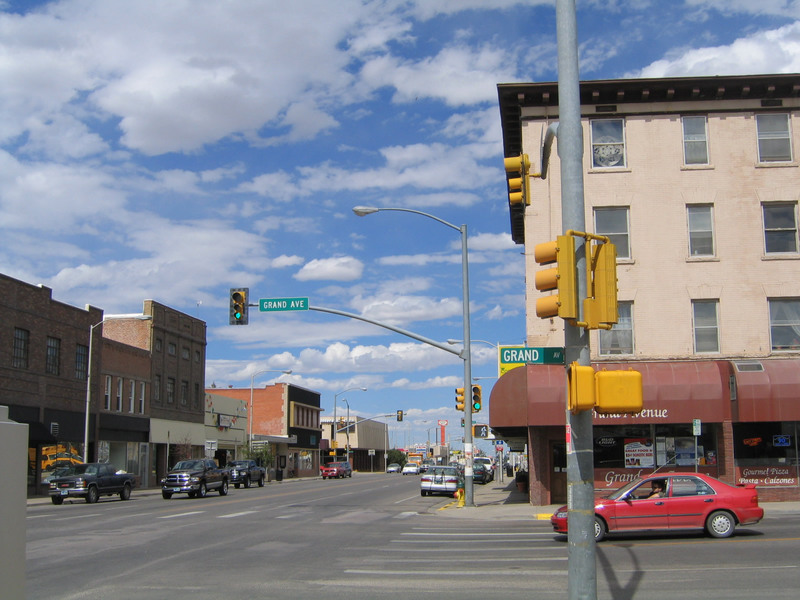 Laramie had a population of 30,816 as of the 2010 Census and 27,204 as of the 2000 Census. Laramie sits at an elevation at 7,165 feet above sea level; the War Memorial Stadium elevation is listed at 7,220 feet above sea level. Photos taken 06/30/08. 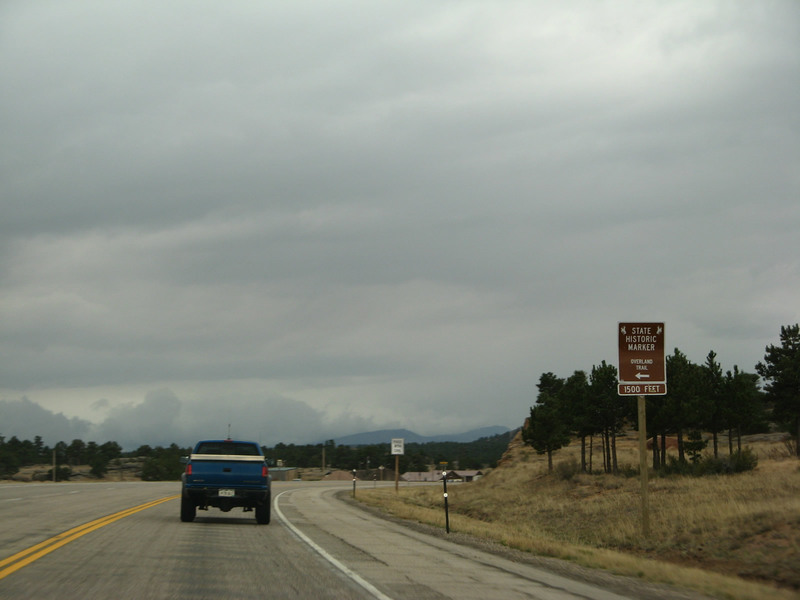 Northbound U.S. 287 approaches the turnoff to the Port of Entry (weigh station). Photo taken 06/30/08. 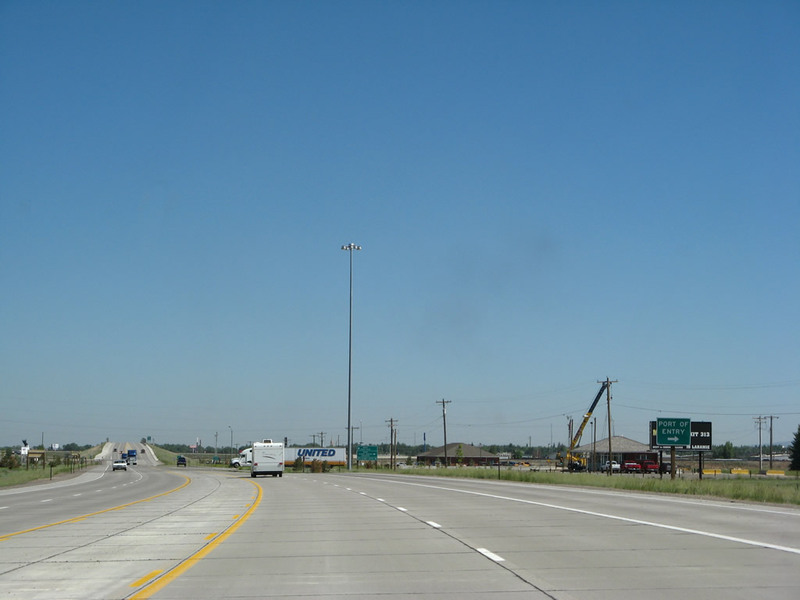 With four lanes and a center turn lane, U.S. 287 north meets the exit to the Port of Entry (weigh station). Photo taken 06/30/08. The north end of the port of entry also includes the local Wyoming Department of Transportation office and drivers license facility. Photo taken 06/30/08. 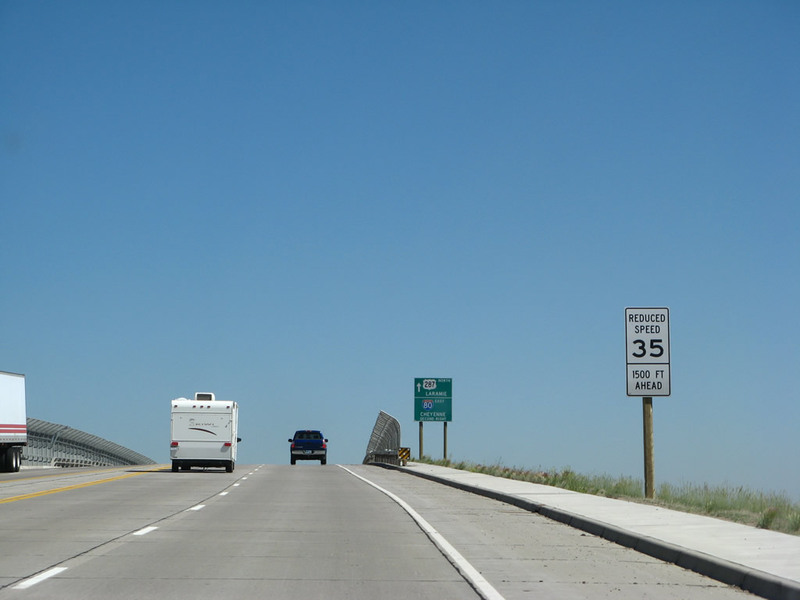 The speed limit along U.S. 287 north reduces to 45 miles per hour as the highway ascends another bridge that separates the highway from the Union Pacific Railroad. Photo taken 06/30/08. 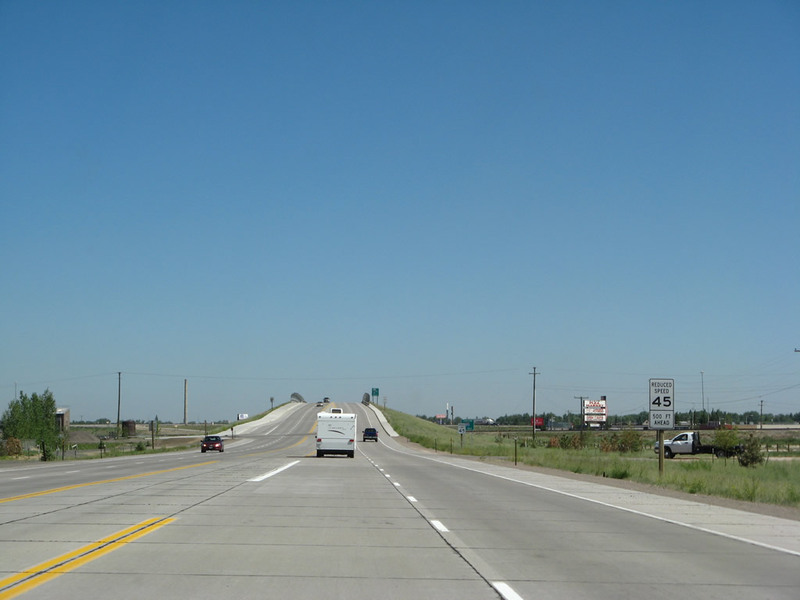 Northbound U.S. 287 approaches its junction with Interstate 80, one-half mile. 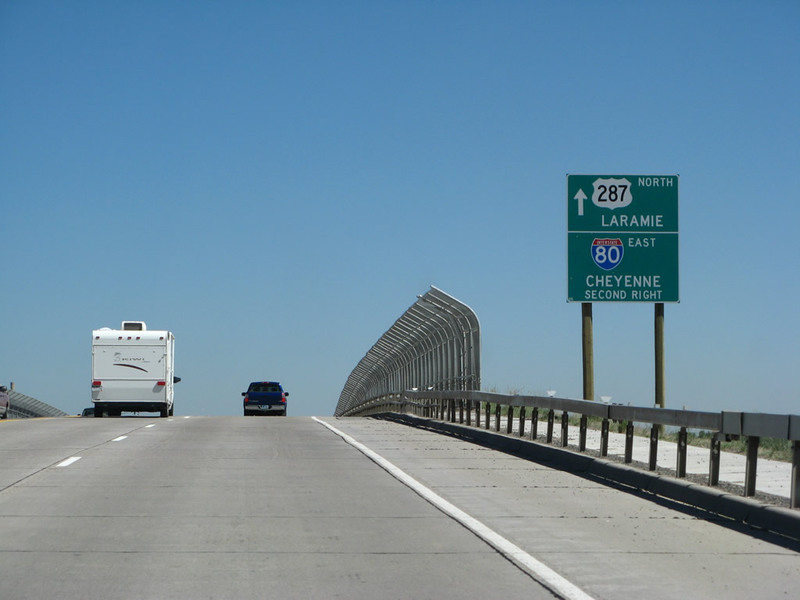 Interstate 80 travels east to Cheyenne and northwest to Rawlins. Photo taken 06/30/08. Ascending the grade separation with the Union Pacific Railroad, U.S. 287 will see its speed limit decrease again, this time to 35 miles per hour. Photo taken 06/30/08. 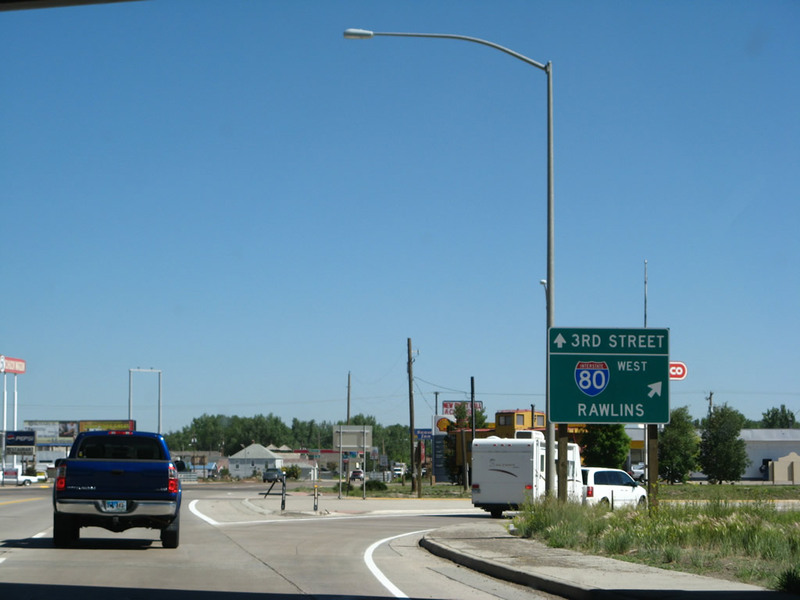 U.S. 287 will proceed north along Third Street into downtown Laramie, while Interstate 80 serves as a bypass route around Laramie. 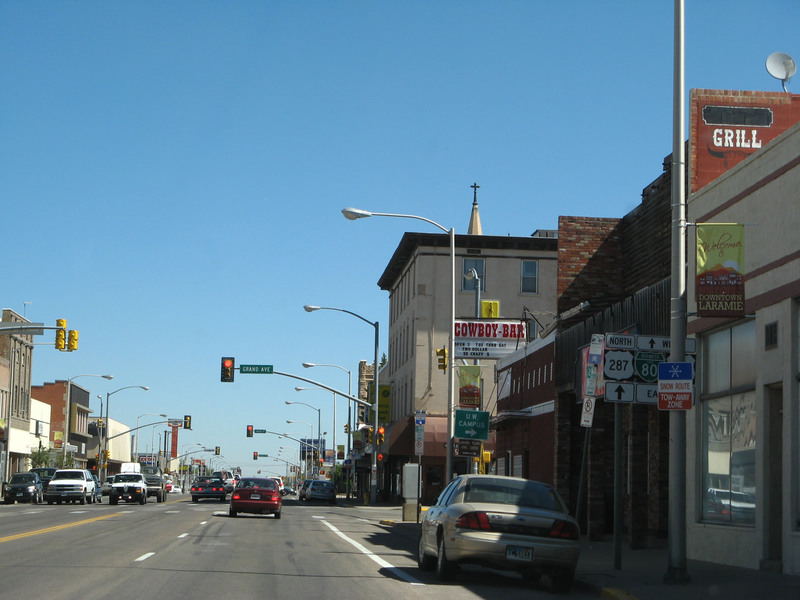 Its business route follows a combination of Curtis Street, Third Street, and Grand Avenue through town. This sign was modified to eliminate the state name from the Interstate 80 route marker and also to change "1200 feet" to "second right." Photos taken 06/30/08 and 08/22/98. Towering fences line both sides of the Union Pacific grade separation. Photo taken 06/30/08. 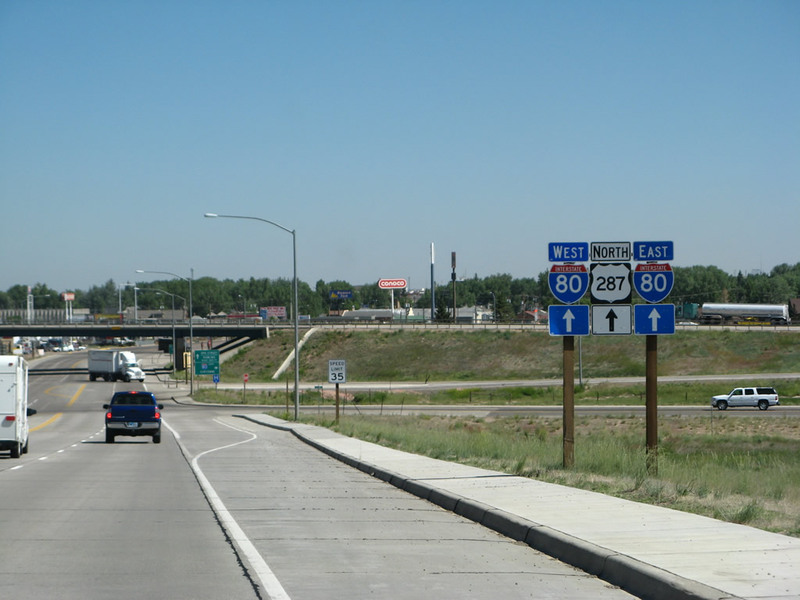 Now in Laramie, northbound U.S. 287 (Third Street) reaches its junction with Interstate 80. 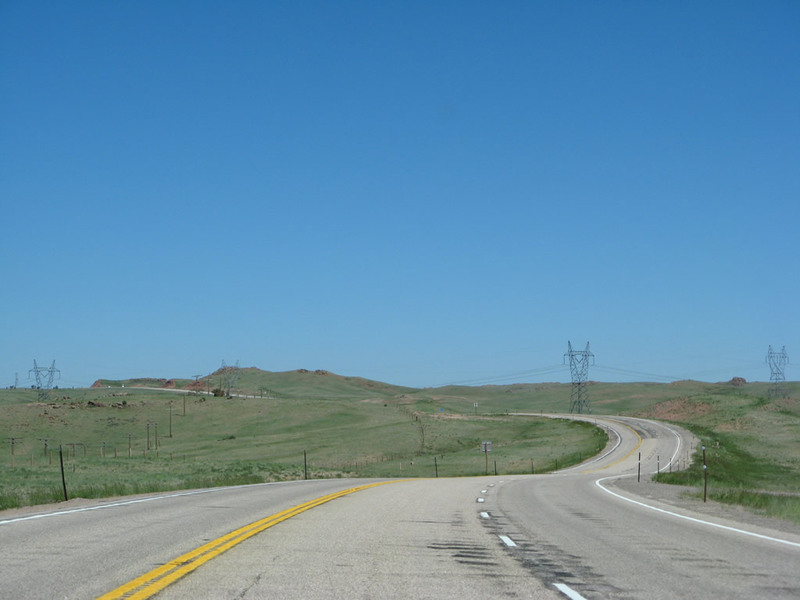 The first right connects to Albany County Route 20/Skyline Drive, and the second right connects to Interstate 80 east to Cheyenne. Use Skyline Drive east to motels and businesses on the south side of the freeway. 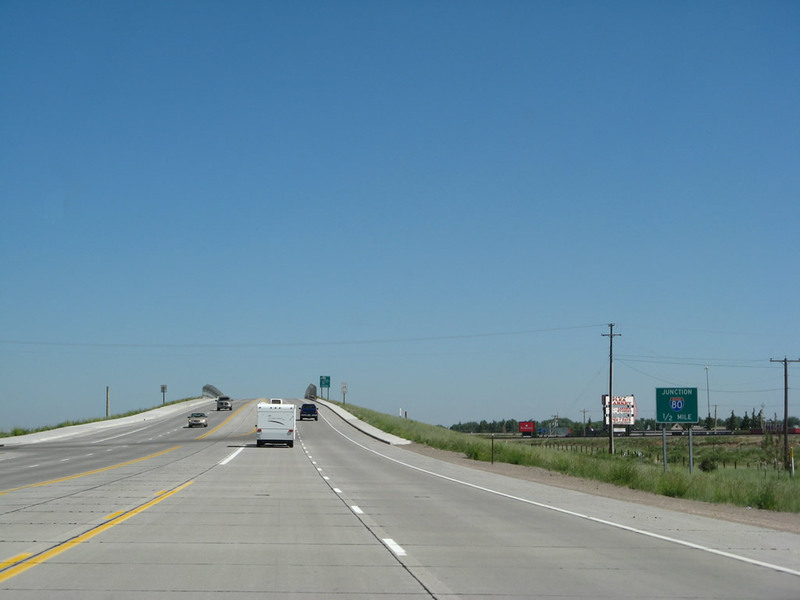 A third right connects to a loop ramp that links to Interstate 80 west to Rawlins and Rock Springs. Photo taken 06/30/08. 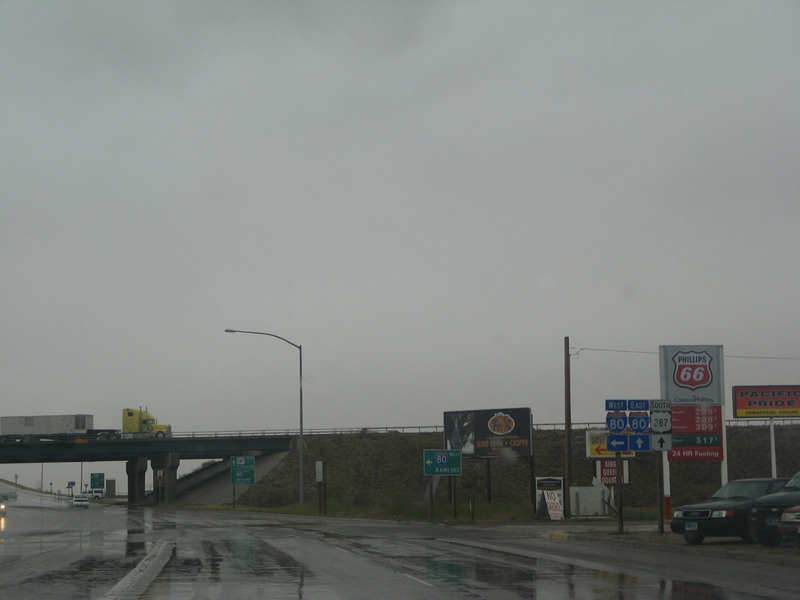 Northbound U.S. 287/Third Street meets the on-ramp to Interstate 80 east to Cheyenne. The following right turn will connect to a loop ramp that links to Interstate 80 west to Rawlins and Rock Springs. Photo taken 06/30/08. 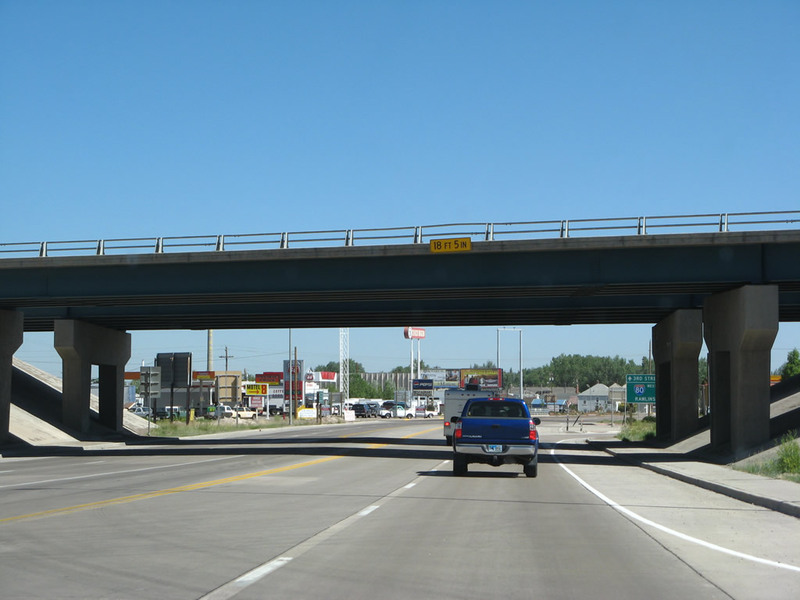 Northbound U.S. 287/Third Street passes under Interstate 80, the Laramie Marginal (bypass). Photo taken 06/30/08. Northbound U.S. 287/Third Street meets the on-ramp to Interstate 80 west to Rawlins and Rock Springs. Through traffic on U.S. 287 could debate whether to jump on Interstate 80 west here to Rawlins via Arlington and Elk Mountain or continue northwest along U.S. 287 to Rawlins via Medicine Bow. Photo taken 06/30/08. Gas stations line U.S. 287/Third Street after the Interstate 80 interchange, and all motorist services (gas, food, lodging) are available at or near this interchange. A frontage road (Boswell Drive) turns right (east) from here to provide local merchant access. Photo taken 06/30/08. The speed limit again drops, this time to 30 miles per hour, and U.S. 287/Third Street straightens out as it approaches downtown Laramie from the south. Photo taken 06/30/08. 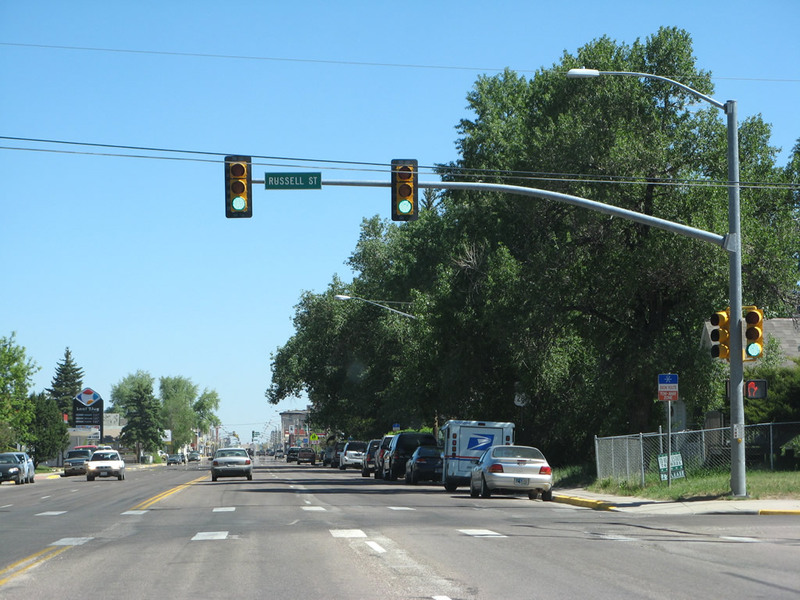 Northbound U.S. 287/Third Street meets Russell Street at this traffic signal. Photo taken 06/30/08. 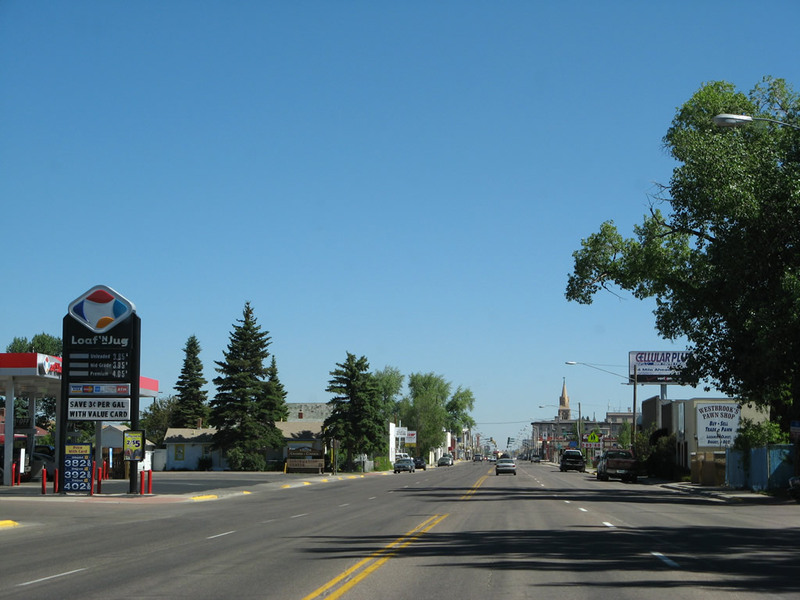 Four lanes carry U.S. 287/Third Street through the southern business district of Laramie. Photo taken 06/30/08. The next major junction along U.S. 287/Third Street northbound will be with Business Loop I-80 and U.S. 30/Grand Avenue. This three-block-ahead sign is posted along northbound Third Street at the intersection with Kearney Street. Photo taken 06/30/08. Northbound U.S. 287/Third Street approaches the signalized intersection with Garfield Street. Just before this intersection is a U.S. 287 reassurance shield, the first one we've seen since near the Colorado-Wyoming border. Photos taken 06/30/08 and 09/07/05. 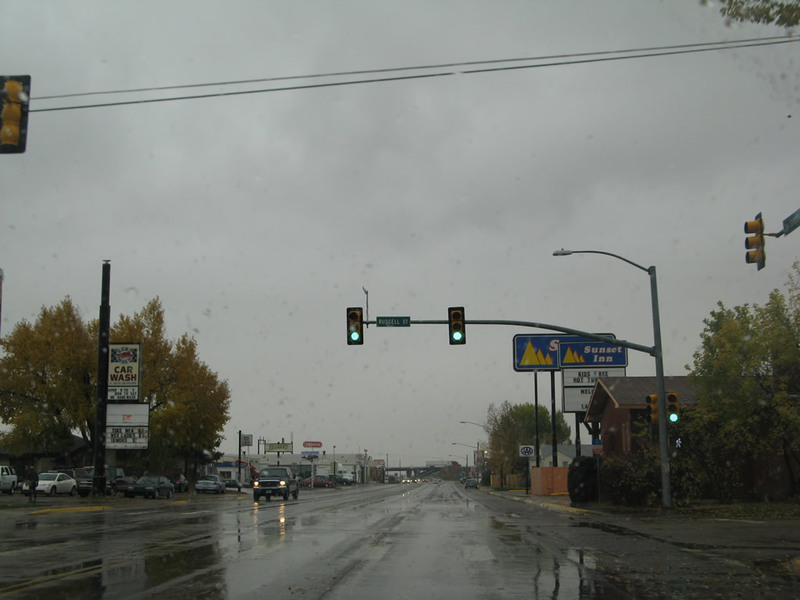 Immediately thereafter, northbound U.S. 287/Third Street meets Garfield Street at this traffic signal. 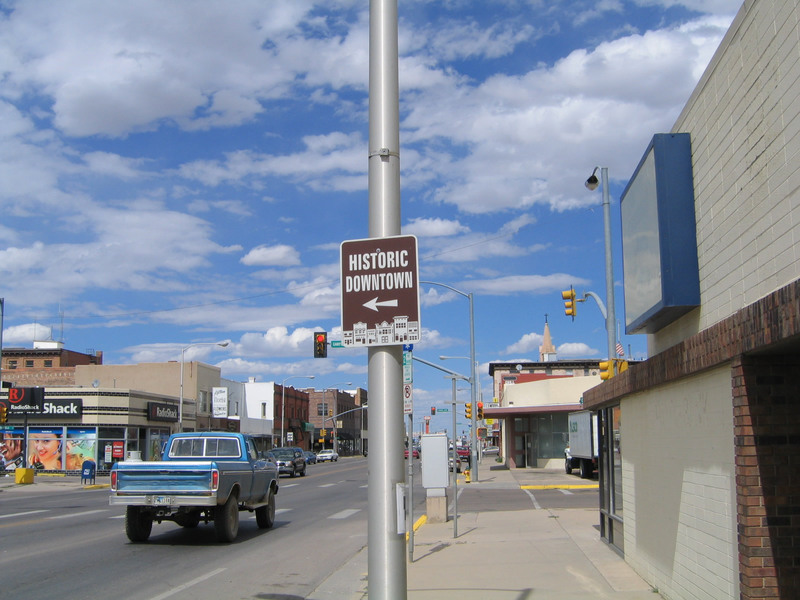 Turn left here for historic downtown Laramie. Photos taken 06/30/08 and 09/07/05. On the block between Garfield Street and Grand Avenue, we find a trailblazer shield assembly for the continuation of U.S. 287 north along Third Street as well as Business Loop I-80 and U.S. 30 east along Grand Avenue (right turn). 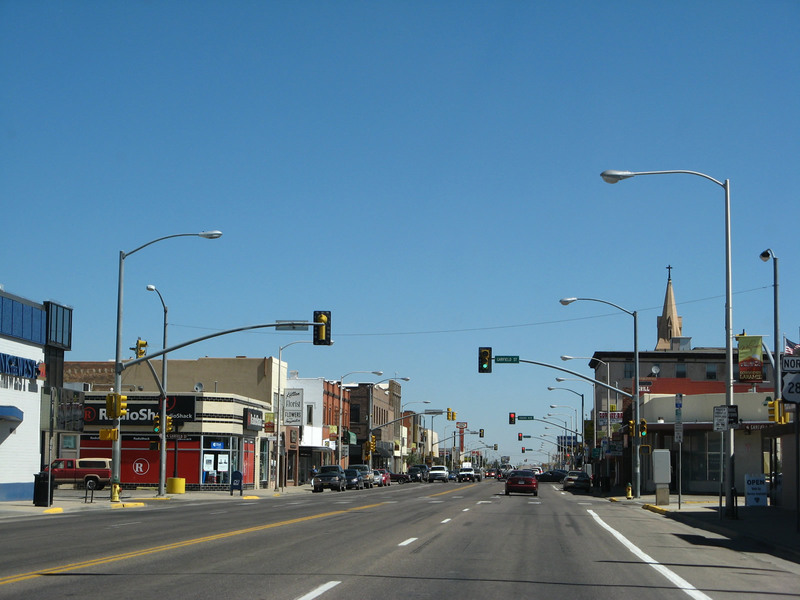 Follow Grand Avenue east to the University of Wyoming. Ahead, U.S. 30-287 and Business Loop I-80 follow Third Street north. Photos taken 06/30/08 and 09/07/05. Northbound U.S. 287/Third Street meets Business Loop I-80 and U.S. 30/Grand Avenue (Lincoln Highway) at this traffic signal. Turn right for U.S. 30 and Business Loop I-80/Grand Avenue east to the University of Wyoming or turn right for grand Avenue west into downtown Laramie. Grand Avenue only travels another two blocks west of here; it ends at First Street at the edge of the Union Pacific Railroad yard. Ahead, the three routes will travel together along Third Street (from Grand Avenue north to Curtis Street). Photos taken 06/30/08 and 09/07/05. These U.S. 287 and Wyoming 789 reassurance route marker shields were posted along northbound between Muddy Gap and Lander in central Wyoming. Photo taken by Mike Ballard, 8/98. 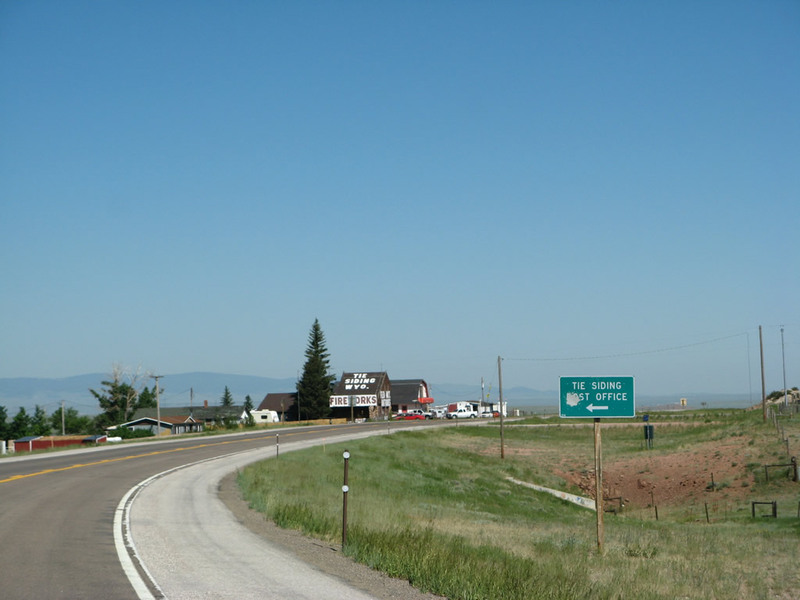 Much farther to the northwest, westbound U.S. 26 and northbound U.S. 287 meet U.S. 89 and U.S. 191 at Moran Junction in the heart of Grand Teton National Park. U.S. 26-89-191 turn south toward Jackson, passing through the Antelope Flats on their way to Moose and Gross Ventre Junction. 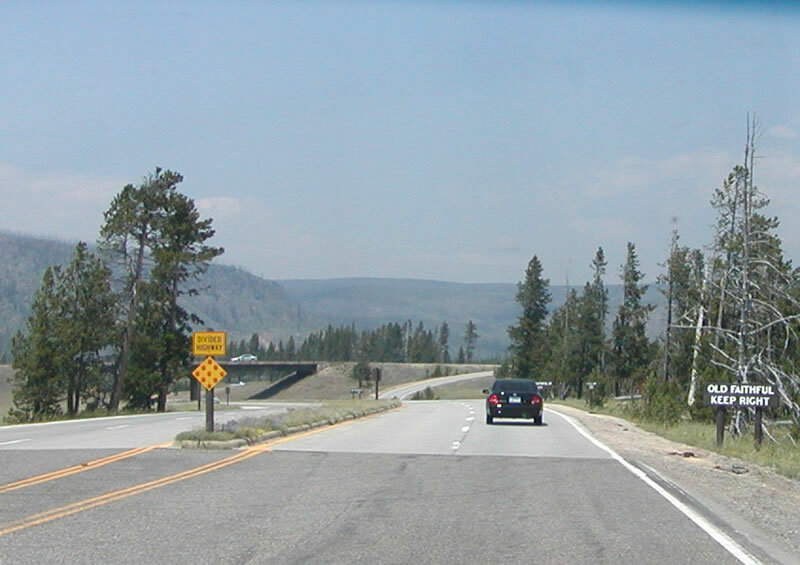 U.S. 287 turns north with U.S. 89 and U.S. 191 toward Yellowstone National Park. Photo taken by Casey Cooper, 07/09/05. 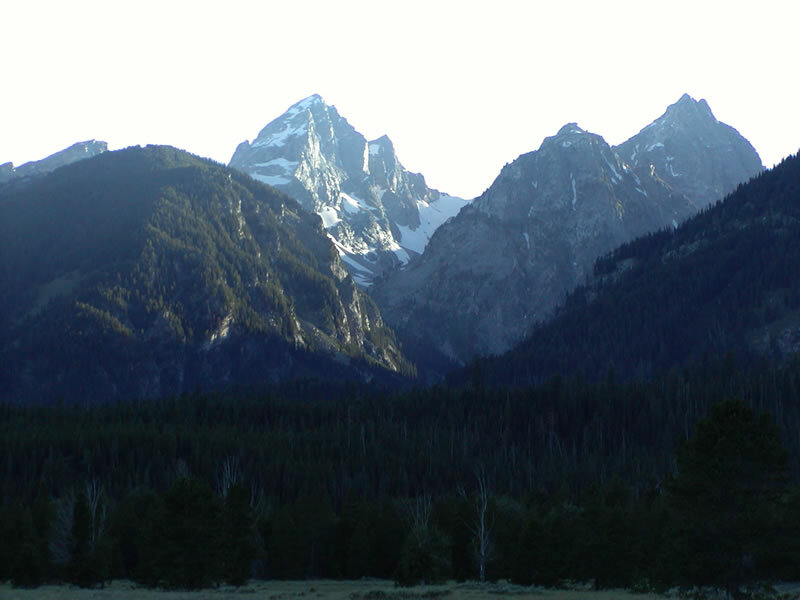 At Moran Junction, the majestic Grand Tetons dominate the skyline, with its jagged peaks backlit by a setting sun in the early evening. Photo taken by Casey Cooper, 07/09/05. Southbound U.S. 287 approaches its junction with Interstate 80 and U.S. 30 in Rawlins. This marks the eastern terminus of the Rawlins business loop and the western terminus of Wyoming 76. Photo taken by Rich Piehl, 5/01. 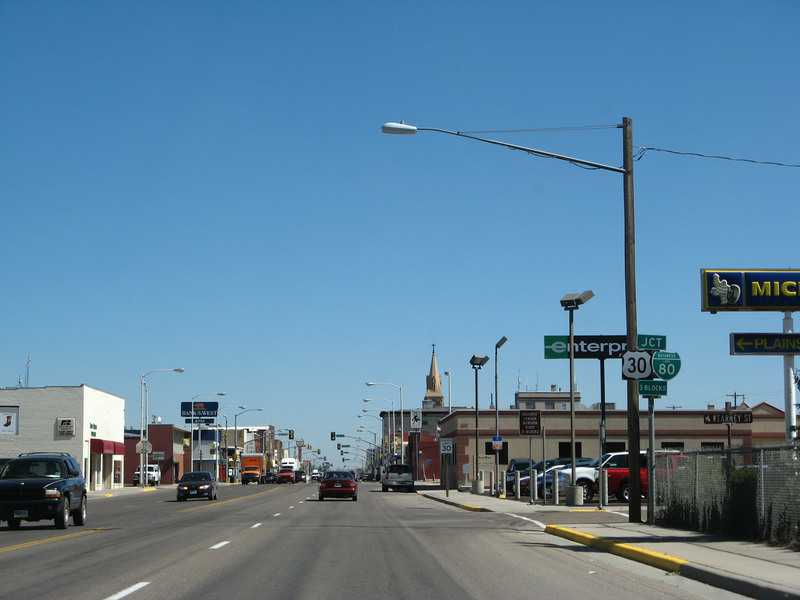 Southbound U.S. 287 and eastbound Business Loop I-80 and U.S. 30 split at the Grand Avenue intersection in downtown Laramie. Photo taken 09/07/05. Leaving downtown Laramie, we find this U.S. 287 south reassurance route marker posted along Third Street between Grand Avenue (Business Loop I-80 and U.S. 30) and Garfield Street. Photo taken 09/07/05. Southbound U.S. 287 approaches its signalized intersection with Russell Street. An early autumn thunderstorm dampened things on a college football Saturday. Photo taken 10/13/07. 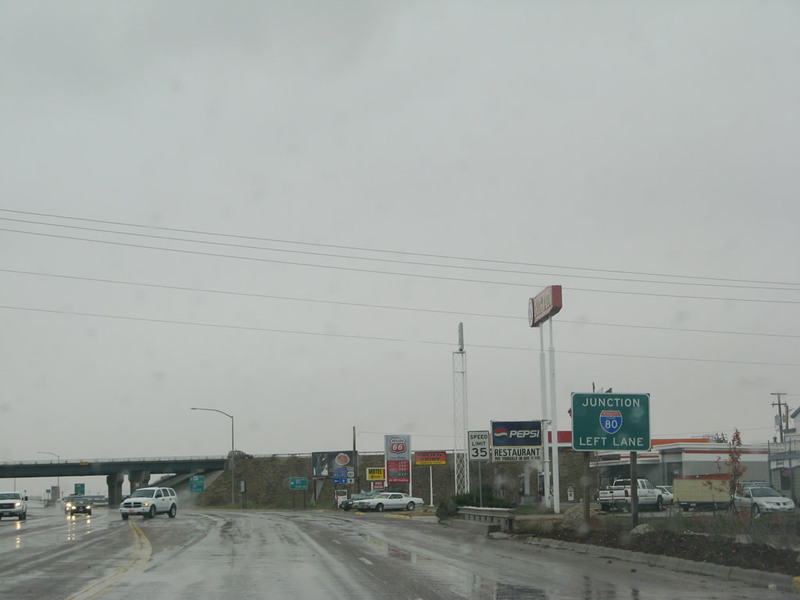 The next major junction along U.S. 287/Third Street is with Interstate 80 west to Rawlins and east to Cheyenne. Photo taken 10/13/07. 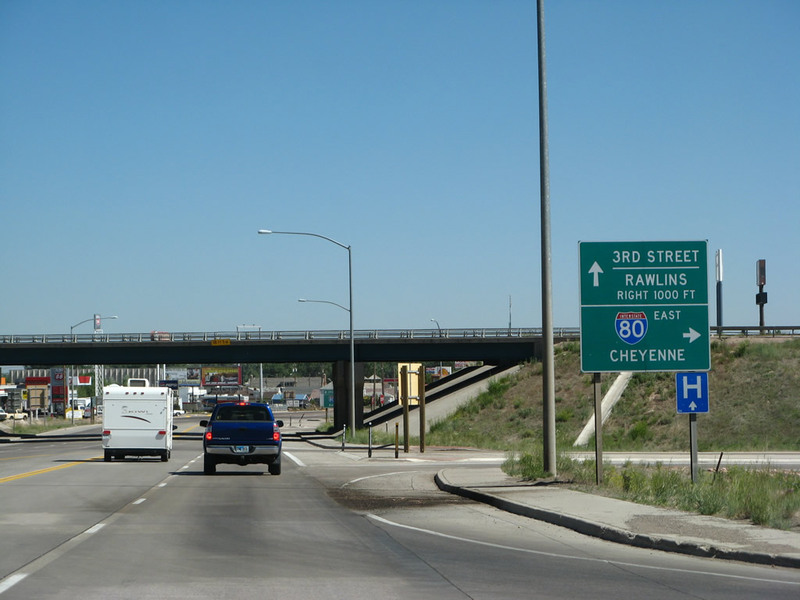 The first left onramp connects to Interstate 80 west to Rawlins, while the second onramp left connects to Interstate 80 east to Cheyenne. Photo taken 10/13/07. Just outside of Tie Siding, formerly two-lane U.S. 287 (which has since been expanded to a four-lane expressway configuration through here) is wet from a recent storm. Photo taken 10/13/07. Southbound U.S. 287 approaches Tie Siding, a very small community with some services on the west side of the highway. Photo taken 10/13/07. Before the highway was expanded to four-lane expressway, this sign used to advise of a passing lane for southbound motorists along U.S. 287. Photo taken 10/13/07. 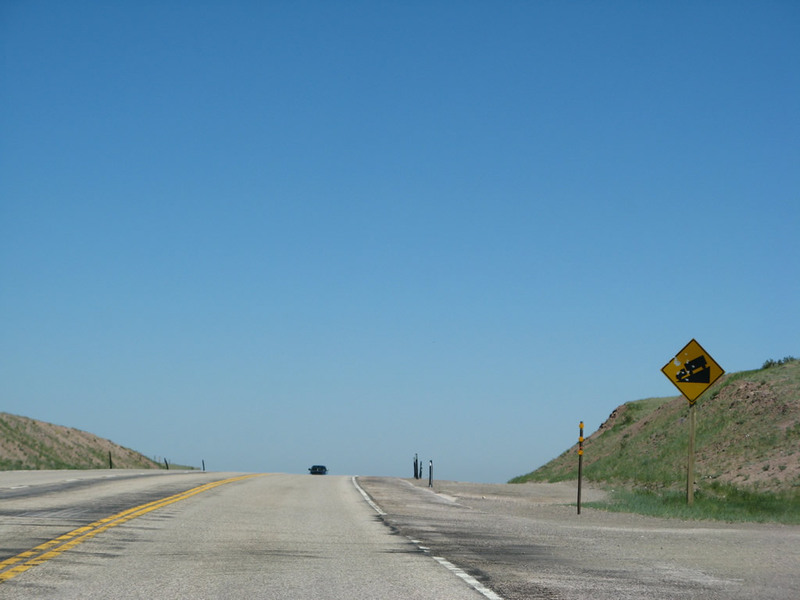 Southbound U.S. 287 begins its ascent up Pumpkin Vine Hill. Snow fences line the sides of the road to reduce snow blowing across the highway. 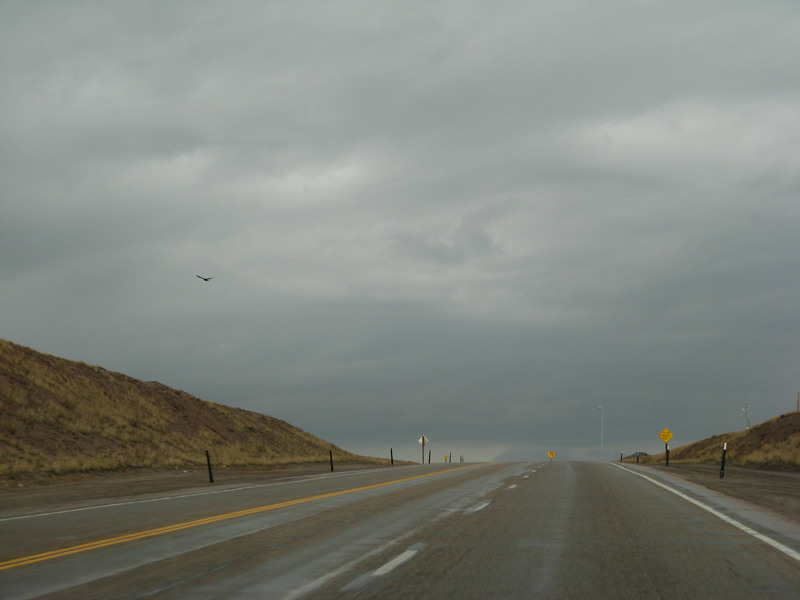 Ominous thunderstorm clouds cover the horizon as the highway used to lose its climbing lane at the top of the hill. Photos taken 10/13/07. 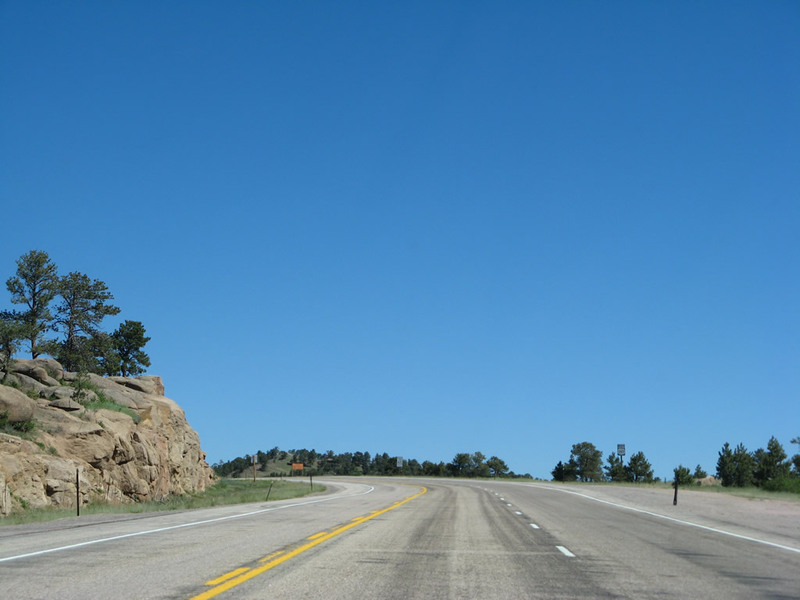 Now at the top of Pumpkin Vine Hill, U.S. 287 will proceed south toward the Wyoming-Colorado State Line. The northbound side of the highway has two lanes, while southbound has one lane. This is actively changing as construction continues to extend the four-lane expressway south toward the state line in 2014. 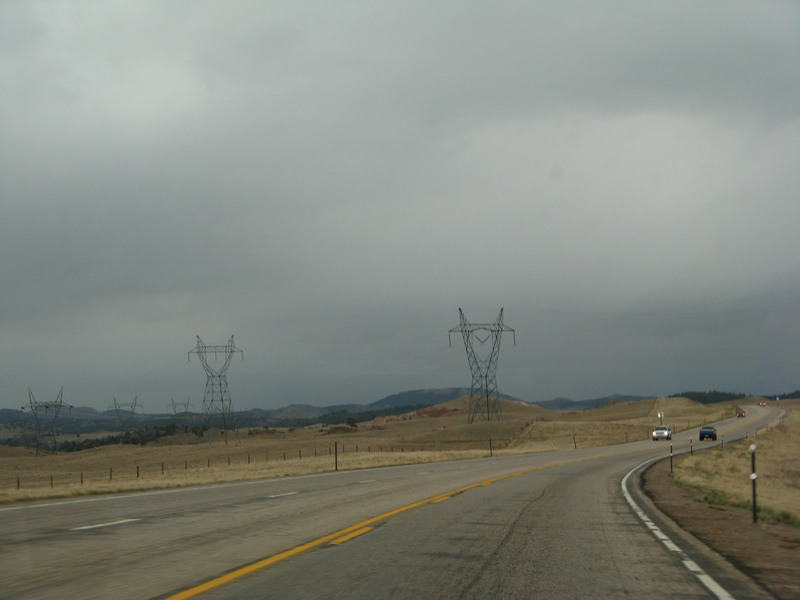 A set of power lines cross over U.S. 287. Photos taken 10/13/07. 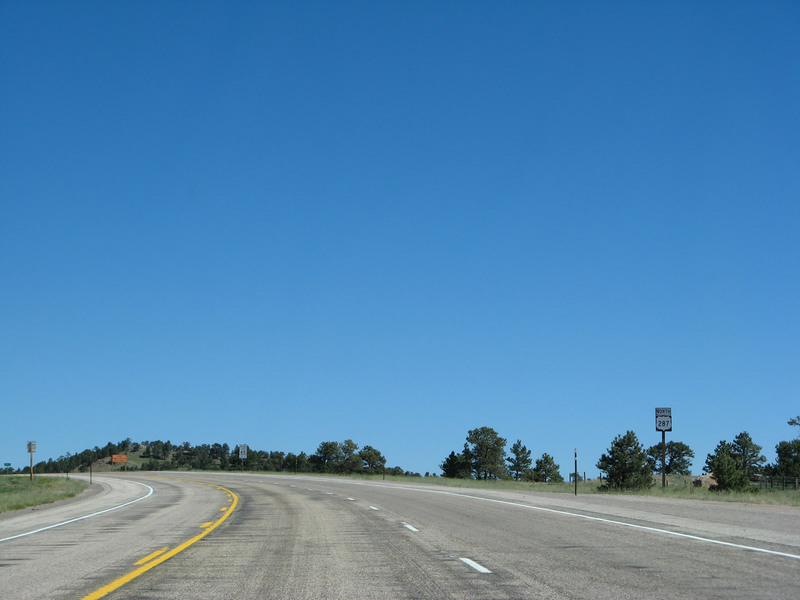 Southbound U.S. 287 continues until reaching the Wyoming-Colorado State Line. 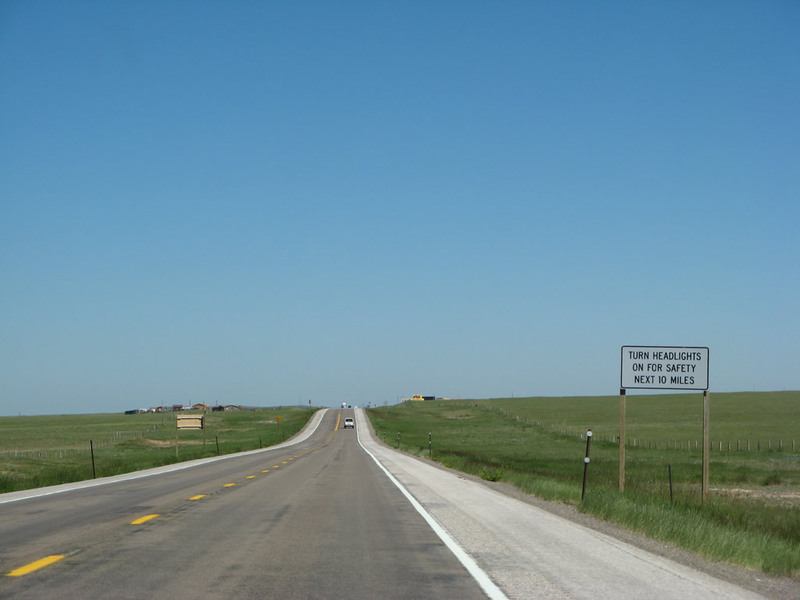 U.S. 287 passes a historic marker for the Overland Trail close to the state line. 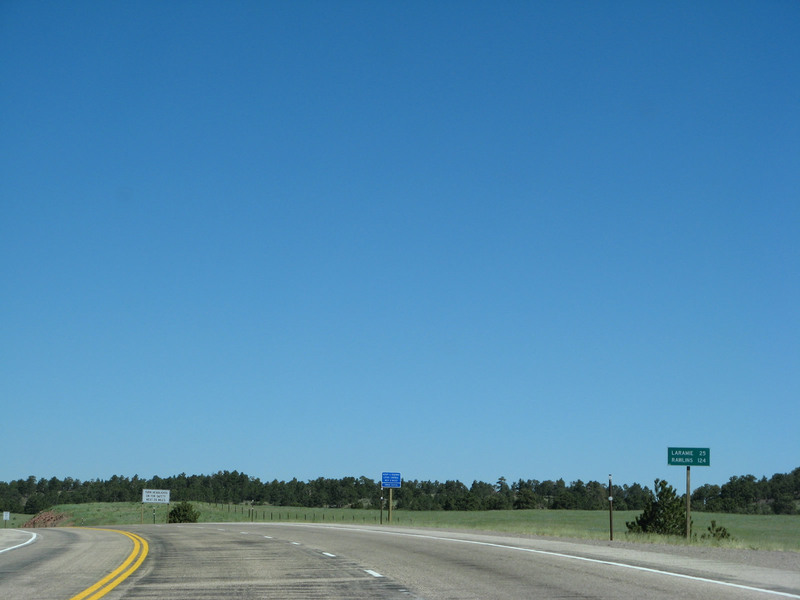 The last milepost is 425.25, but that is not the mileage for all of U.S. 287 in Wyoming. 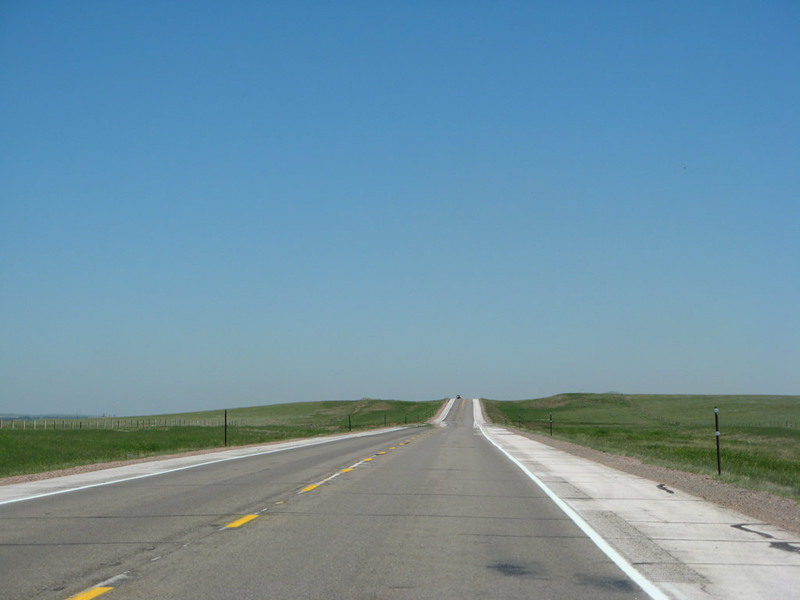 Instead, it is just part of the numbering system just for the segment of U.S. 287 south of Laramie, and it has a zero milepost of 400. The milepost numbers then increase from north to south, which is uncommon for a north-south route. Photos taken 10/13/07.